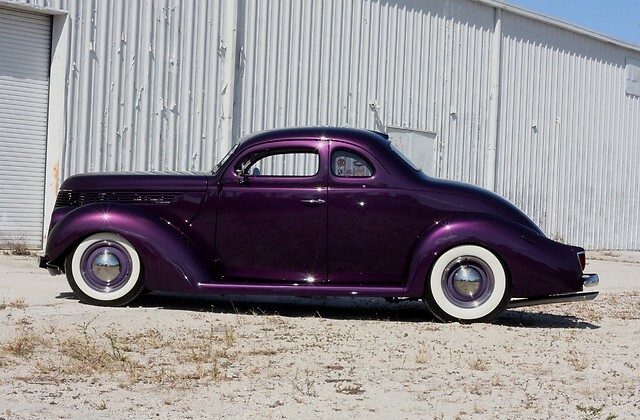 was anxious to see jim thompson’s latest build, a stunning ’36 ford. 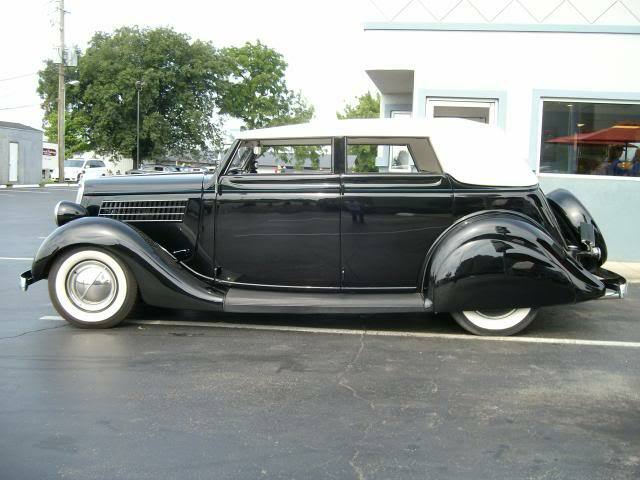 packard grill, shoebox dashboard, chevy hood sides and flush mount skirts. 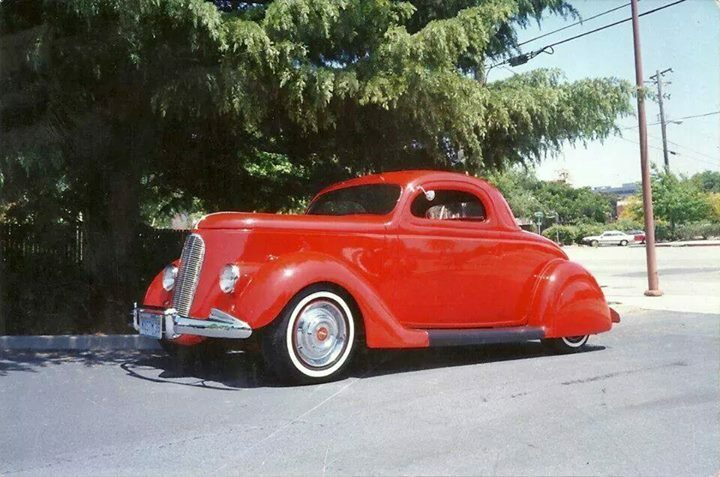 Bob Hooper's "DREAM BOAT" '36 ford by (Dee) Wescott's Auto Restyling in Boring Oregon. by the Brother Tommy & Bill Carr. 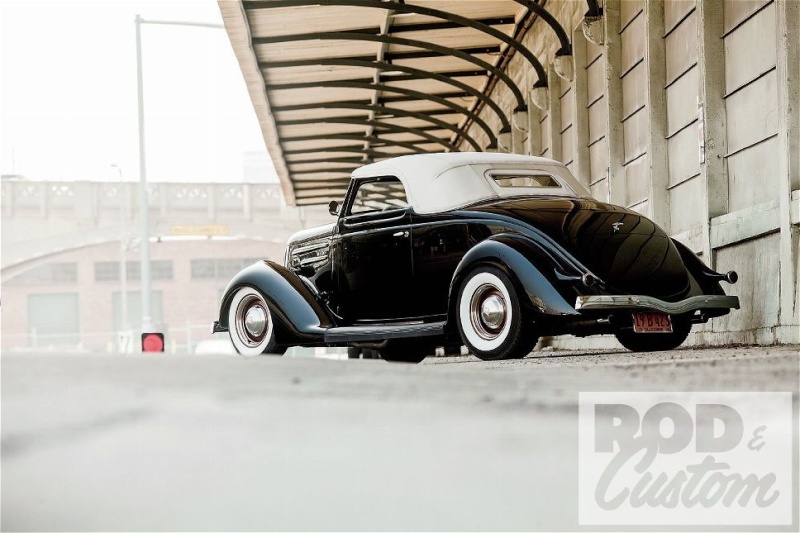 Commissioned by the prior owner to reflect the groundbreaking customs he saw prowling the streets of Chicago during his youth, this 1936 Ford Roadster was built by Donn Lowe. 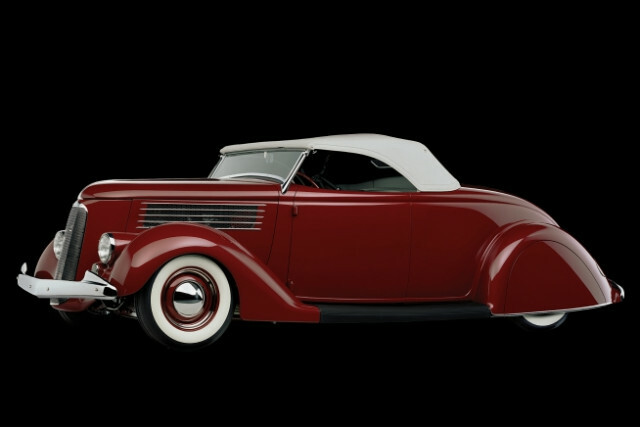 The body was painstakingly restored, the rumble seat was eliminated in favor of a full-size trunk, the rear fender skirts were hand-fabricated and the cowl was hand-built from the best parts of three donor units, while the front headlight pods originated from a 1940 Chevrolet. 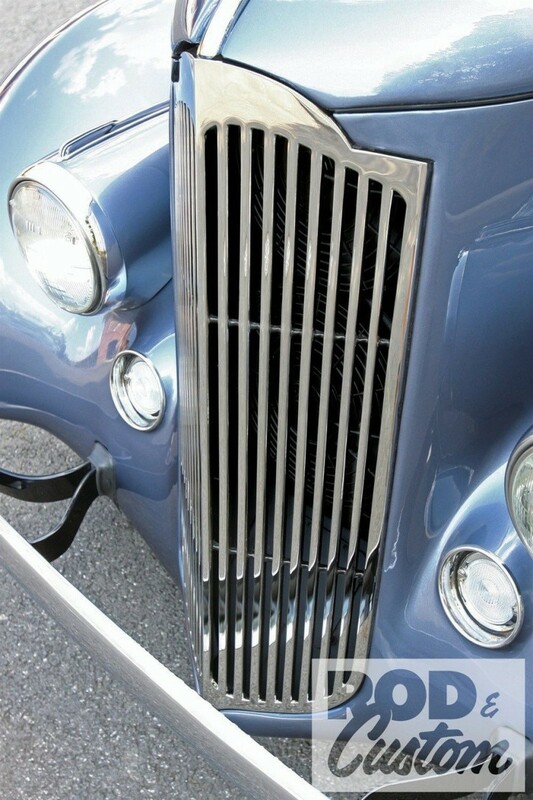 A hand-made grille insert incorporates a narrow 1939 LaSalle grille, perfectly replicating a period customizing technique. 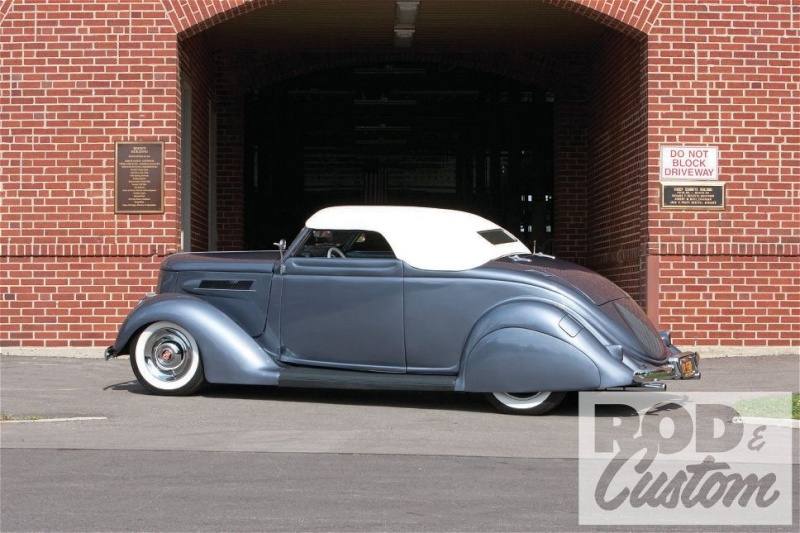 The front bumper is a subtly modified 1940 Oldsmobile unit, while LED taillights with acrylic lenses highlight the rear, along with a windowed license-plate compartment. Finished in metallic maroon lacquer, the Roadster has a speedster-style Bob Lee top, including hidden snaps and padded seams. 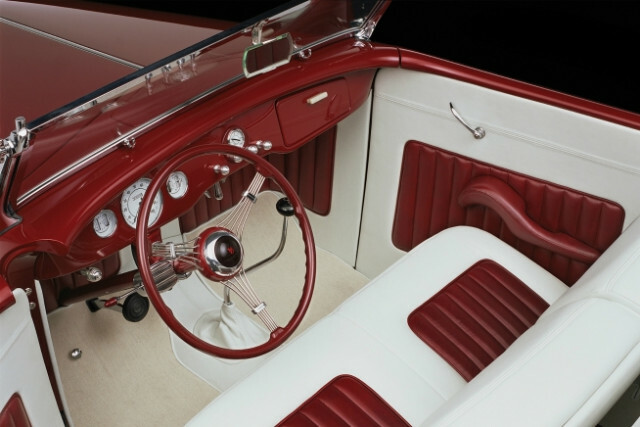 The interior, trimmed by Jim Griffin of Bend, Oregon, includes a split-back bench seat with white and maroon leather, along with white Wilton wool carpeting, a theme continued to the trunk compartment. 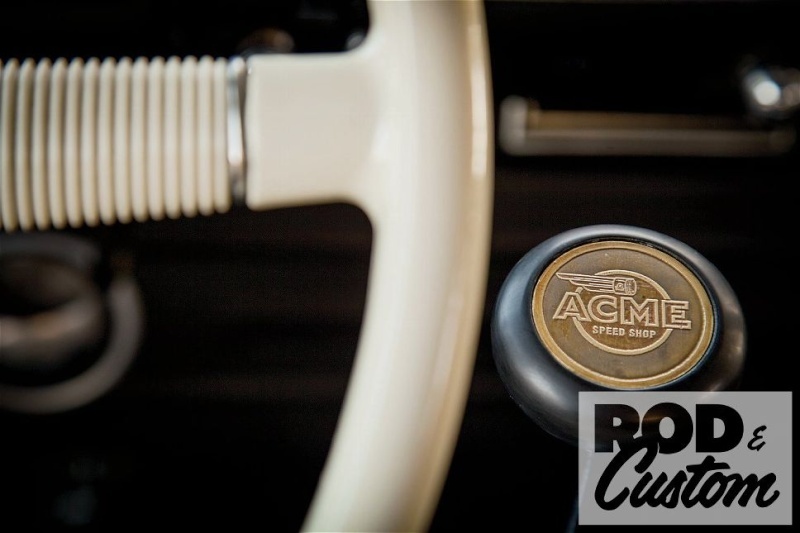 The stock dash features white-faced factory-style instruments, while the circa-1939 Ford banjo steering wheel was adapted to accept a standard horn button from a 1940 Ford. 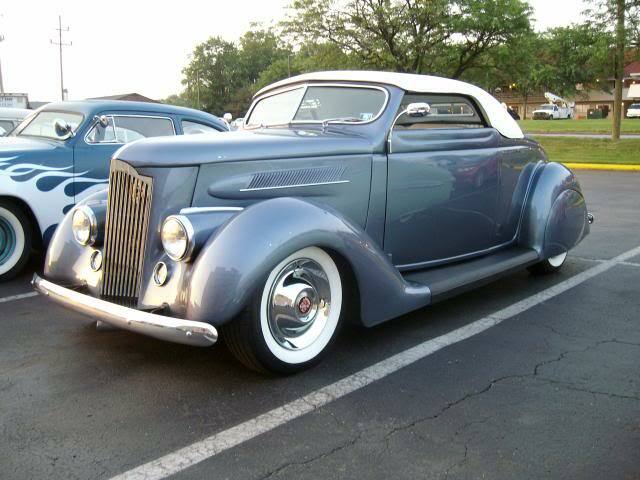 Wiring was provided by Painless Performance of Fort Worth, Texas. 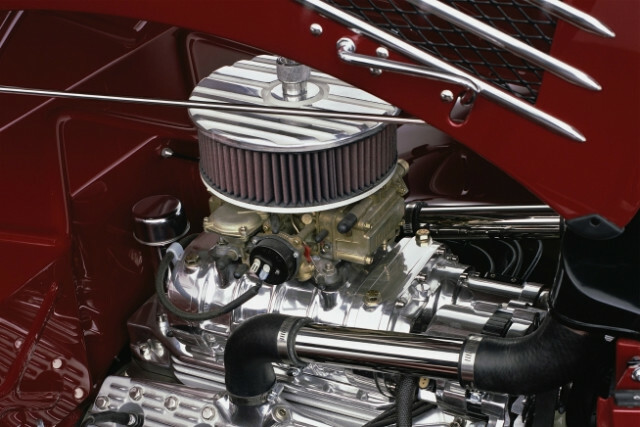 The hot 286 cubic inch Flathead V8 was machined by Yo Sigisawa of Contemporary Auto Machine of Huntington Beach, California and assembled by Bob Primmer of Costa Mesa, with a forged reciprocating assembly. Other equipment includes a 400JR Isky racing cam and a pair of aluminum high-compression Navarro cylinder heads, fly-cut by Bob McCray Performance for larger Isky valves. 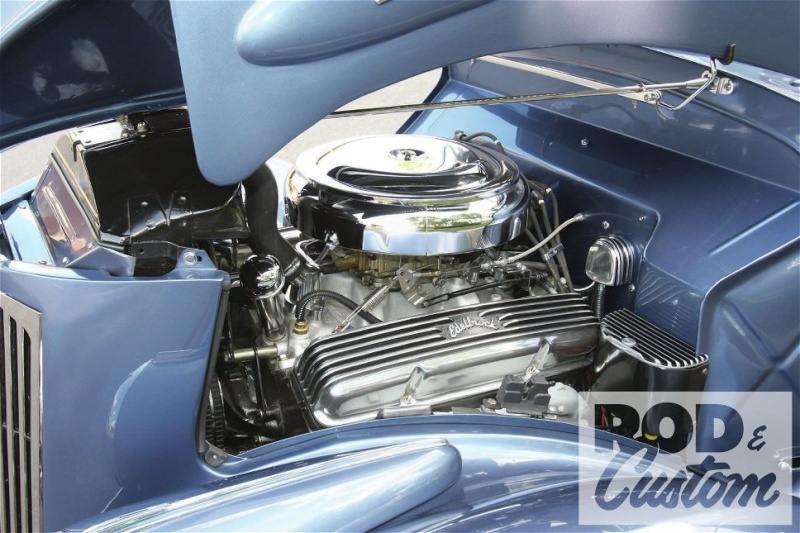 A Roadrunner Engineering Weiand supercharger, topped by a 390-cfm Holley four-barrel carburetor, provides induction. 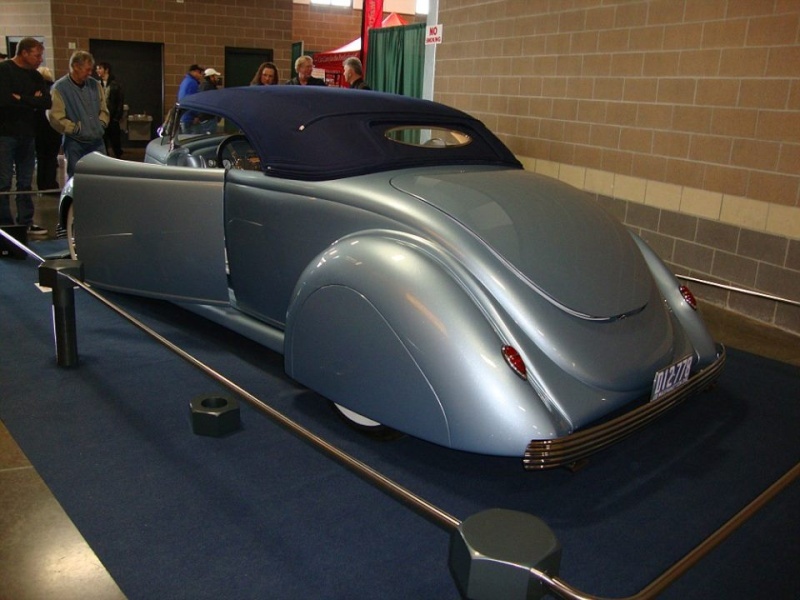 A Vertex magneto provides ignition, while ceramic-coated, three-into-one tubular headers feed a two-inch dual exhaust system with “glass pack” mufflers. 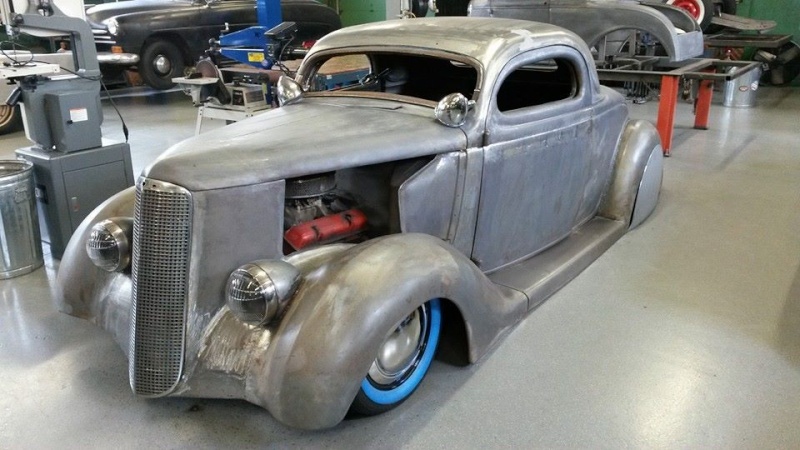 Rounding out the mechanical package, the Roadster has a Ford C4 automatic transmission driving a 1930s-vintage Ford banjo-type rear end with 3.54:1 gears, semi-floating axles and open drive by Hot Rod Works of Nampa, Idaho. 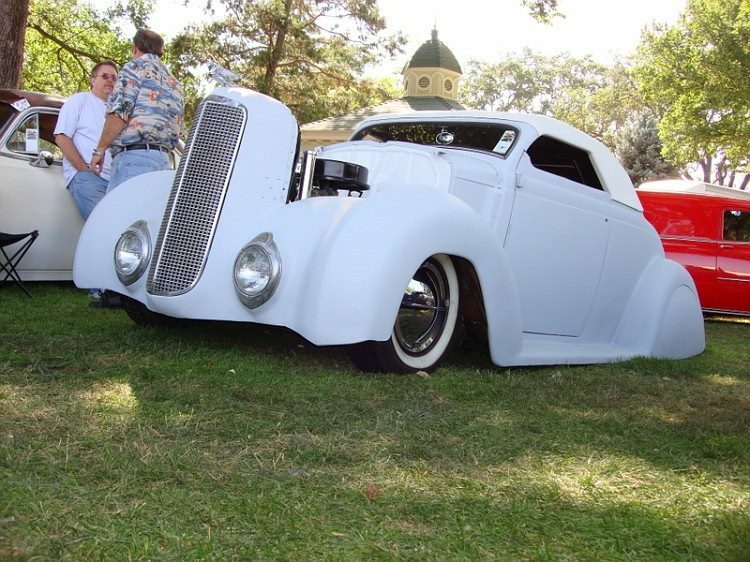 The front suspension features a forged front axle by Chassis Engineering with stock-type 1937-1941 Ford spindles, while Pete & Jake’s provided the bolt-on steering arms and wishbone split kit and Ken Fenical’s POSIES contributed the reversed-eye spring. 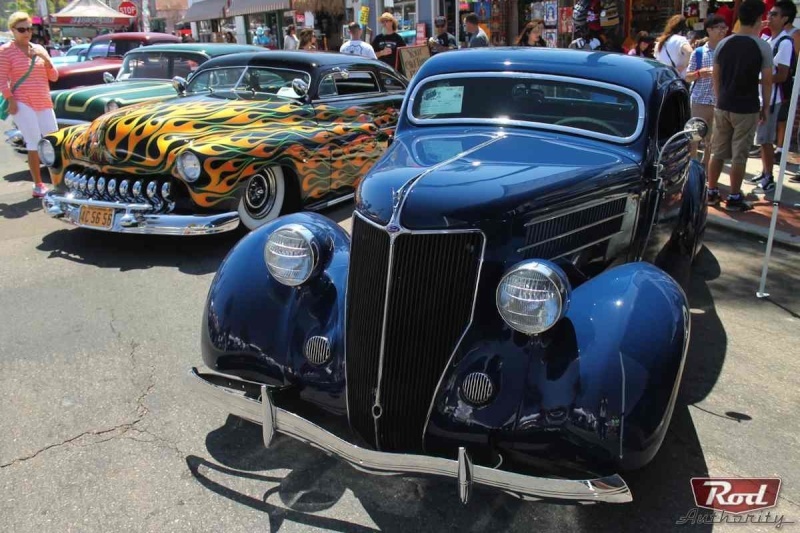 Braking has been upgraded with a hydraulic system, with a Pete & Jake’s dual-circuit master cylinder controlling a set of front disc brakes with vented front rotors and four-piston calipers within Buick-style drums that are complete with Ford-style backing plates, by So-Cal Speed Shop. A pair of Ford Bronco 11-inch drums handles rear braking. 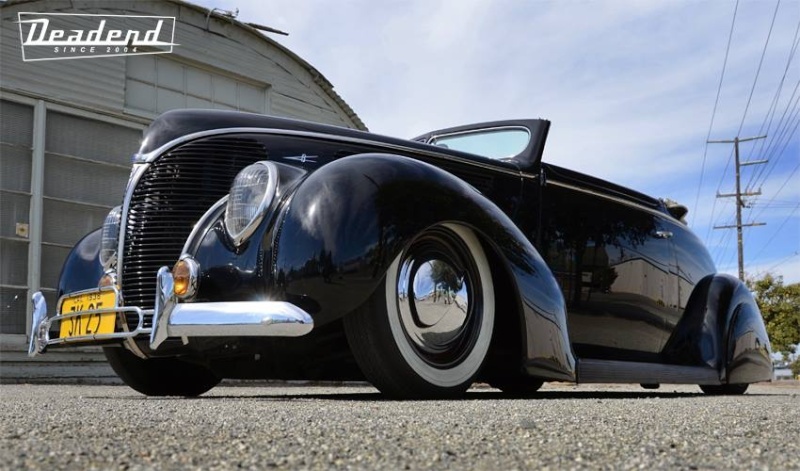 Rolling on a set of 1946-1948 Mercury steelies with 1940 Ford-style hubcaps by Wheel Vintiques and shod with a set of BF Goodrich-style tires from Coker Tire, the Roadster possesses an unmistakable profile, with all the power, performance and attitude of the early hot rods of the late 1940s and early 1950s. 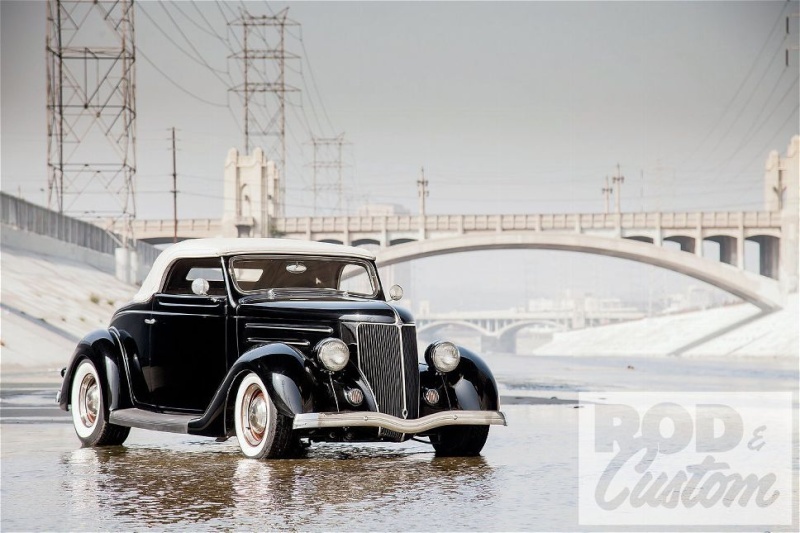 The subject of a February 2008 feature in Street Rodder, this magnificent 1936 Ford Roadster truly represents the fulfillment of boyhood dreams. 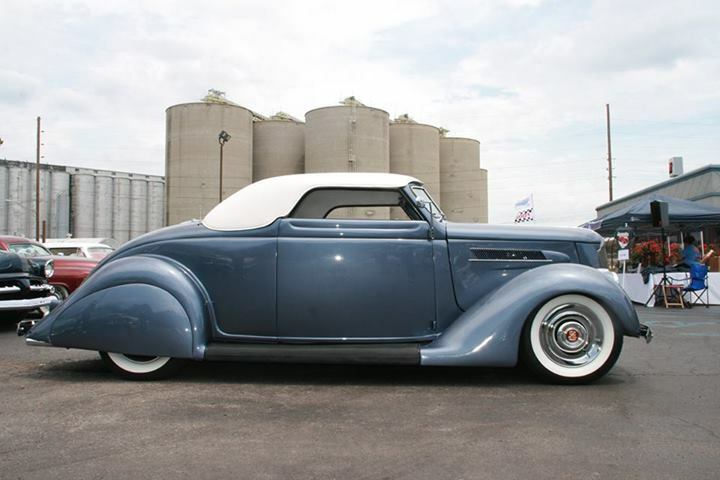 This car was auctioned off by RM Auctions in January of 2010 at the Arizona Biltmore Resort & Spa, Phoenix, Arizona. 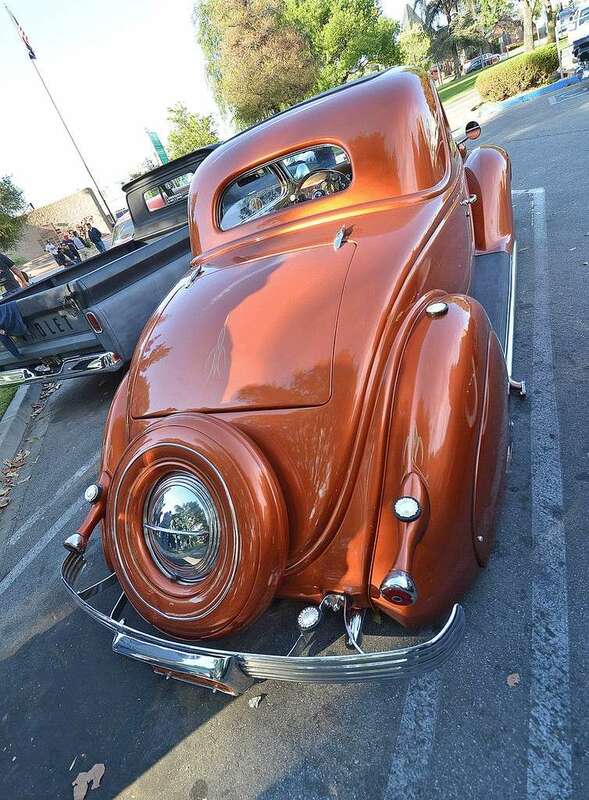 231 hp, 286 cu. in. 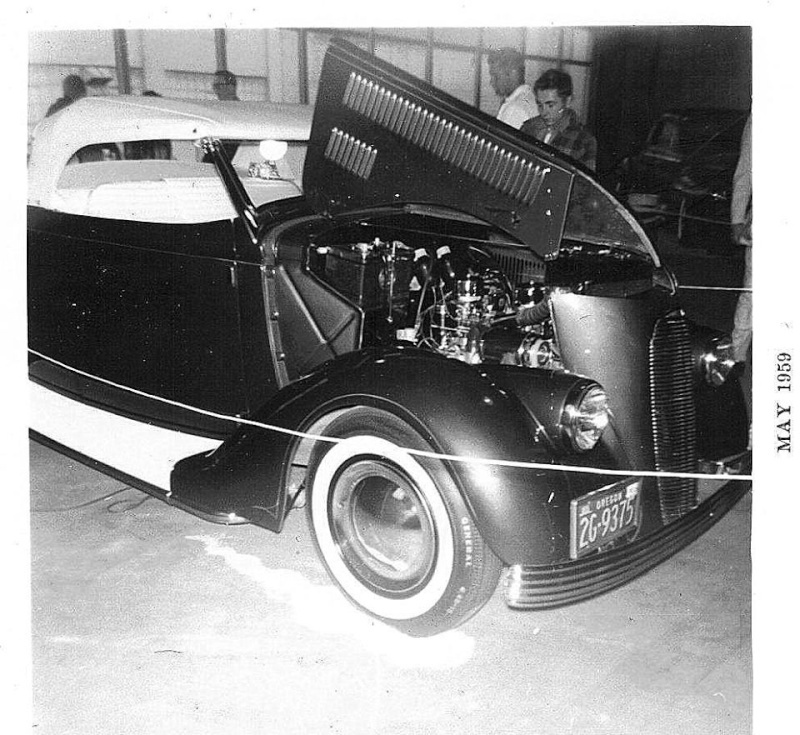 Ford “Flathead” V8 engine, Weiand supercharger, four-barrel Holley carburetor, Ford C-4 three-speed automatic transmission, forged front axle by Chassis Engineering, stock-style 1937-1941 Ford spindles, Pete & Jake’s bolt-on steering arms and wishbone split kit, reversed-eye spring by POSIES, semi-floating rear axle, and hydraulic front disc, rear drum brakes. 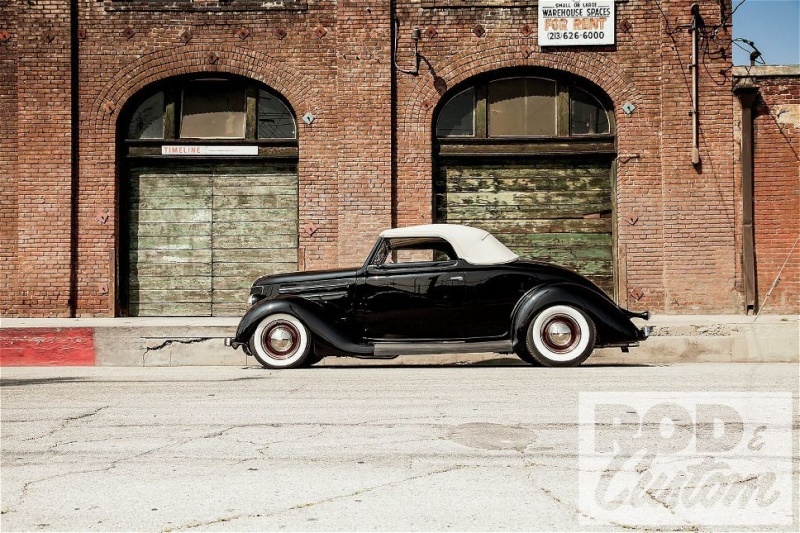 Wheelbase: 106"
A Westergard-style 1936 is surely in the top five on most kustom aficionados' dream car lists. We know it was for Pennsylvania's Jim Thompson. 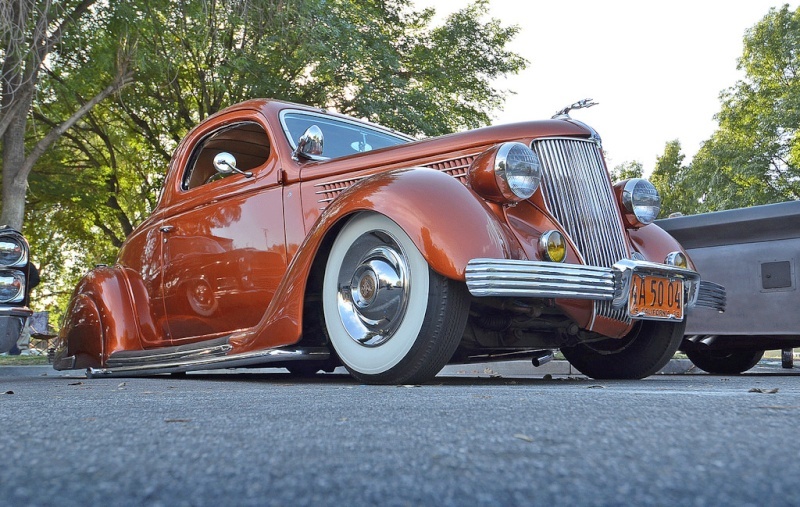 Not only has he been involved with customs since his first trip to Sled Scene East in Gettysburg, Pennsylvania, some 25 years ago, but he admits, "After years of visualizing my dream of a Westergard-style, Carson-topped 1936 Ford, and 23 years of looking at the reproduction 1940 Packard grille hanging on the wall of my garage, I began the search for a 1936 Ford cabriolet." That search finally ended in Nashville with this basket case. OK, it's not a basket case now, but it was when Jim dragged it home. 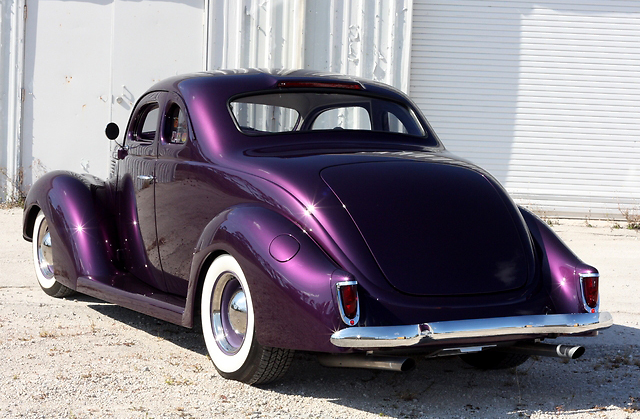 Within two days the stock windshield posts had been removed, replaced by the chopped windshield surround from a 1949 Ford parts car, as Jim had long envisioned the car with a V'd windshield. 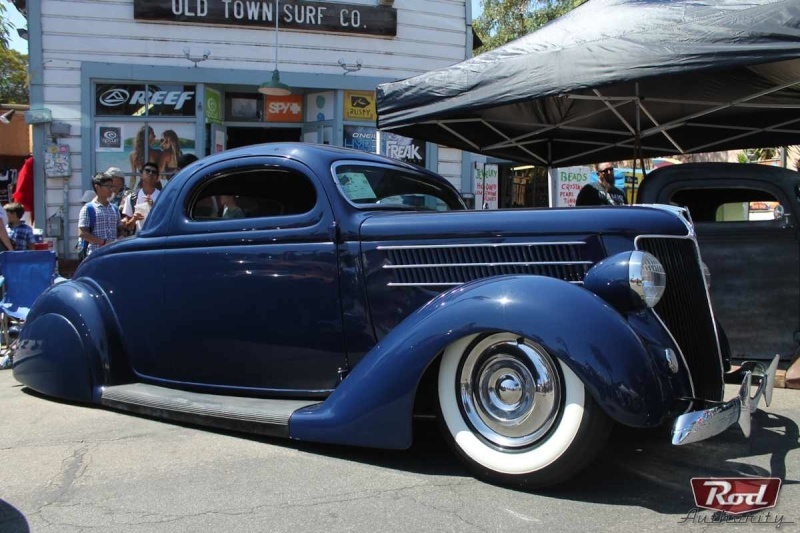 With this completed to his satisfaction, and a healthy 6 inches lower than the stocker, Jim turned to the chassis. 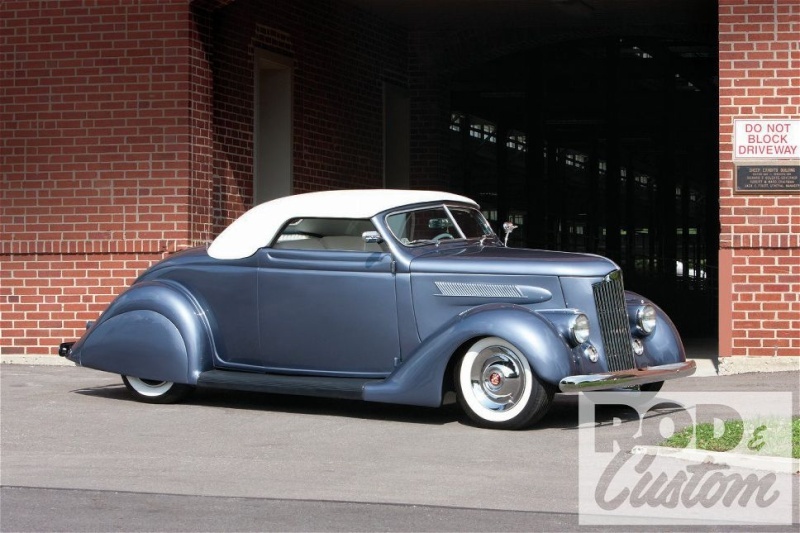 Figuring a convertible body flexes more than a coupe or sedan, he opted to underpin his kustom with a Fatman Fabrications frame, outfitted with an 8-inch Ford rearend on Posies springs and a Mustang II IFS using QA1 coilovers. 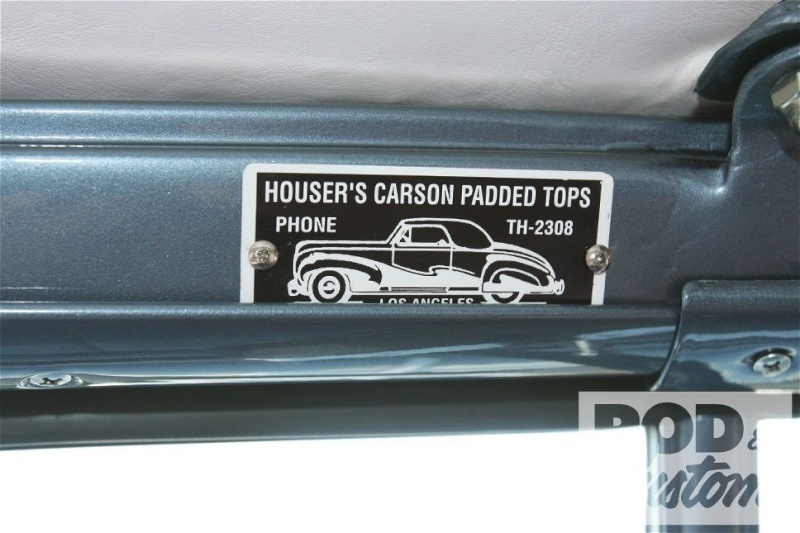 With a solid foundation upon which to build, new floorpans went in, swiftly followed by the hand-built Carson-style top. 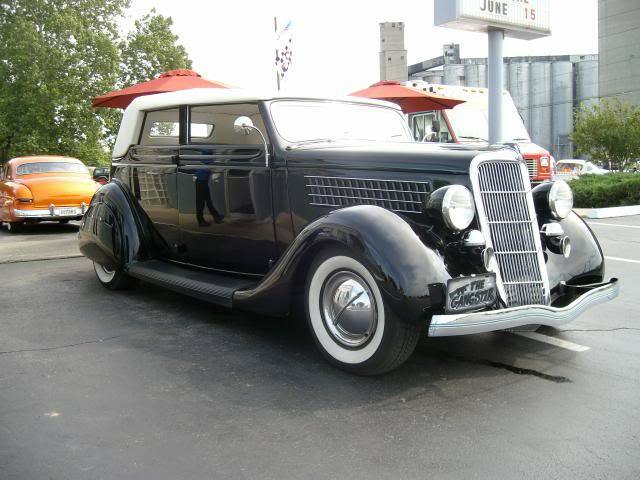 A steel perimeter frame was constructed along with a windshield header, door glass apertures, and top bows. This was followed by a covering of chicken wire and fiberglass mat. 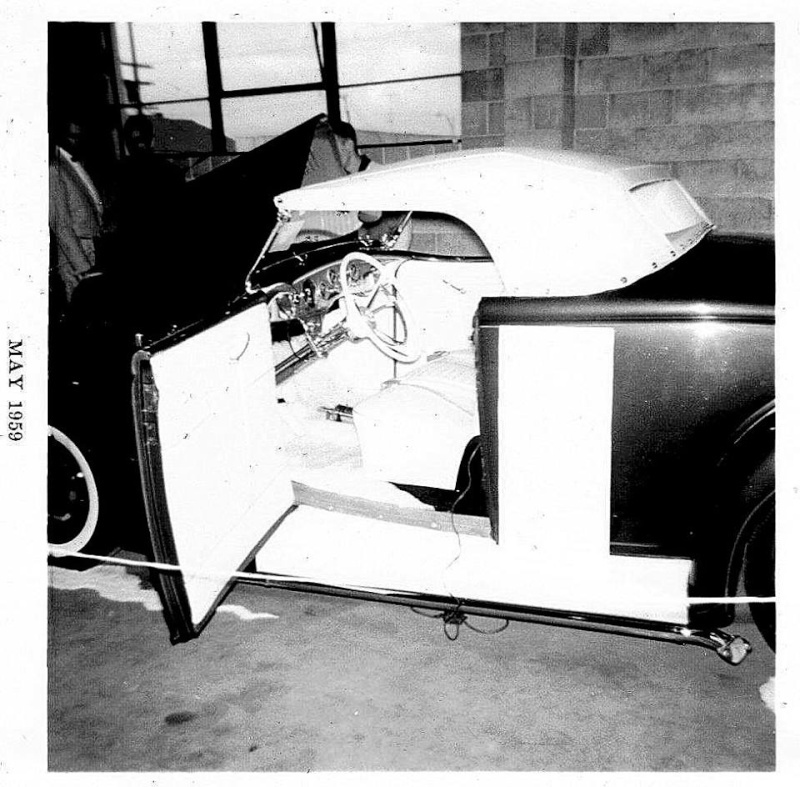 A new rear window from LeBaron Bonney was installed and door window frames fabricated, which would later be chrome plated. 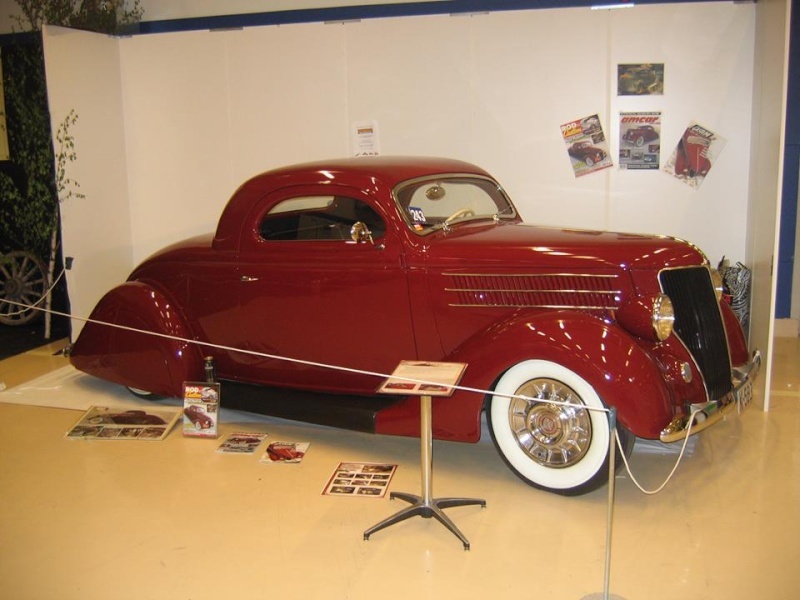 The windshield frame and roof were undoubtedly major tasks, but so is the bodywork on any custom, and the 1936 was no exception. 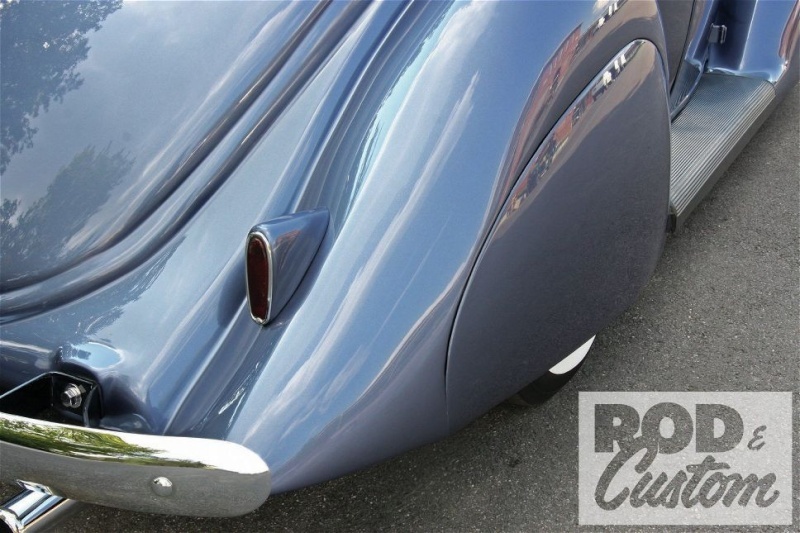 Jim narrowed the dashboard from that 1949 parts car by 14 inches to fit the 1936 body, then moved on to modify the rear wheel openings to accept the teardrop fender skirts, which are now mounted in recesses. 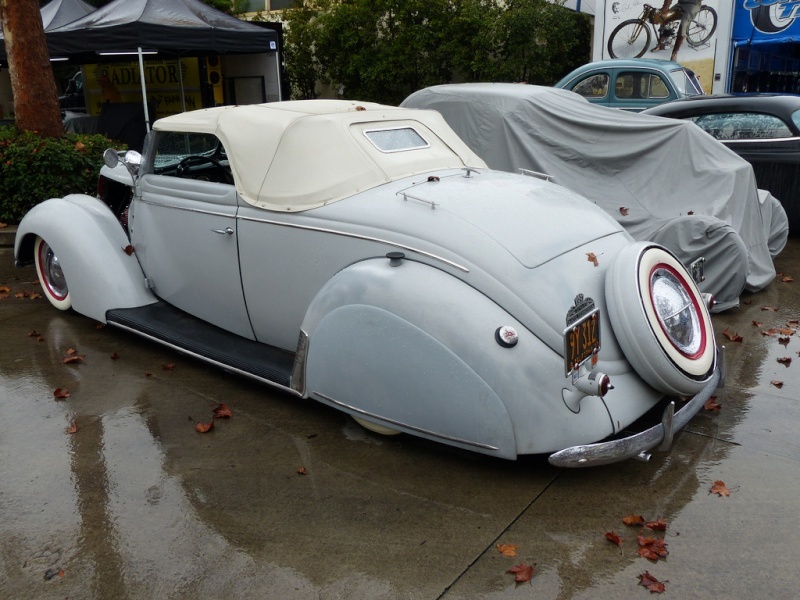 If you're wondering what the taillights are from, they're 1940 Packard, donated by a good friend, and mounted offset to the inside of the rear fender peaks. 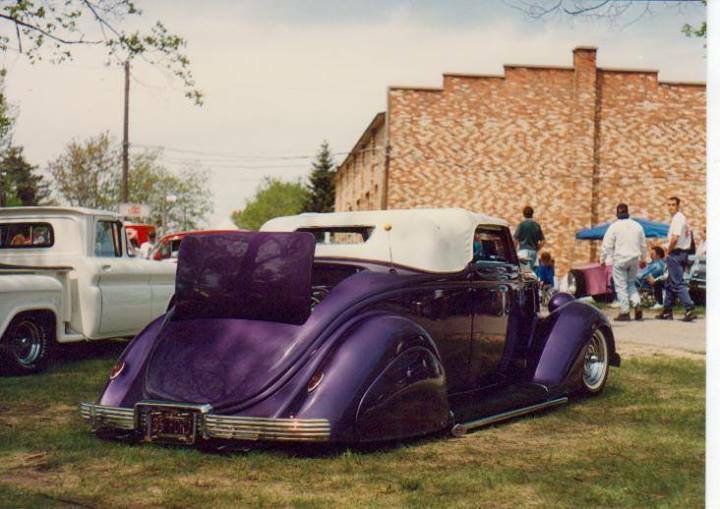 Those fenders have been molded to the body, too. 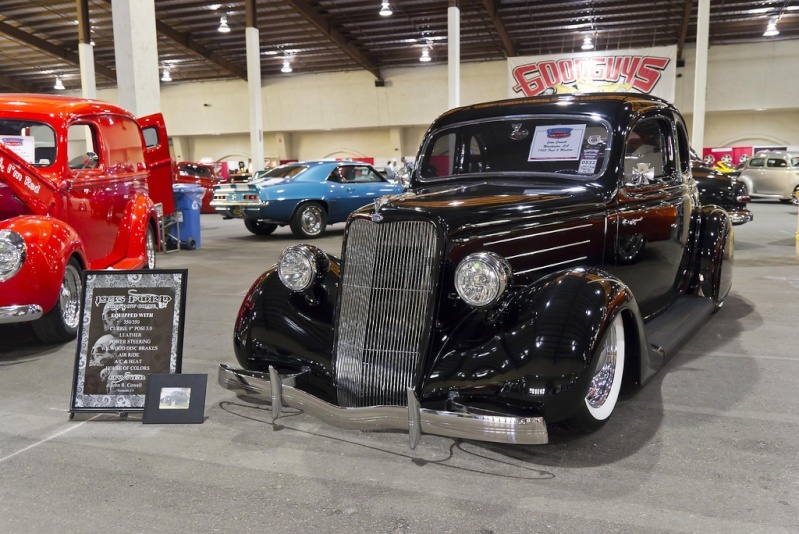 That Packard grille finally came down off the garage wall and made its way onto the 1936, as did 1937 Chevy hood side louvers, a pair of 1940 Chevy headlights, and 1940 Ford pickup bumpers, front and rear. 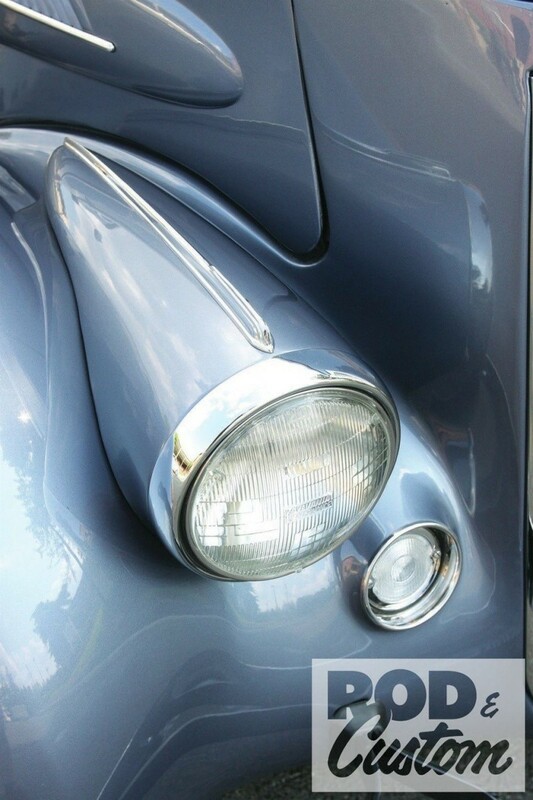 Jim tackled all the modifications and bodywork himself, as well as spraying the DuPont Spectermaster Blue. 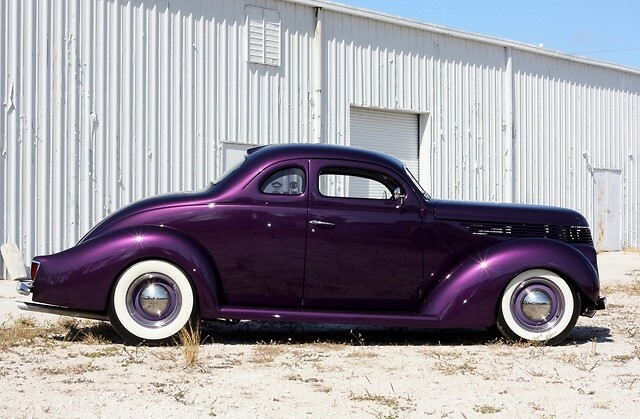 He says that painting the entire car in pieces and then reassembling it all without damaging anything was the most challenging part of the entire build. 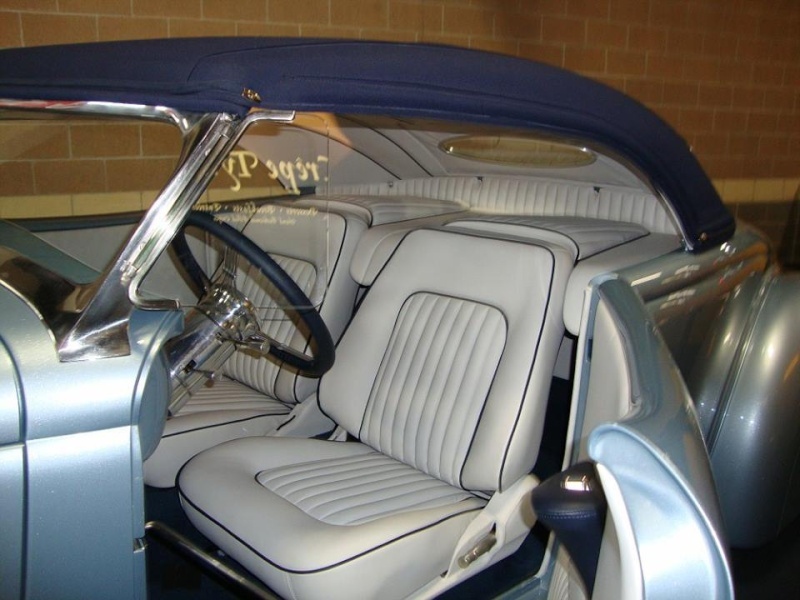 After the endless bodywork, wiring, engine and transmission installation, paint choices, exhaust system, chrome plating, and a million other jobs, the car was finally at the point where it could be upholstered. 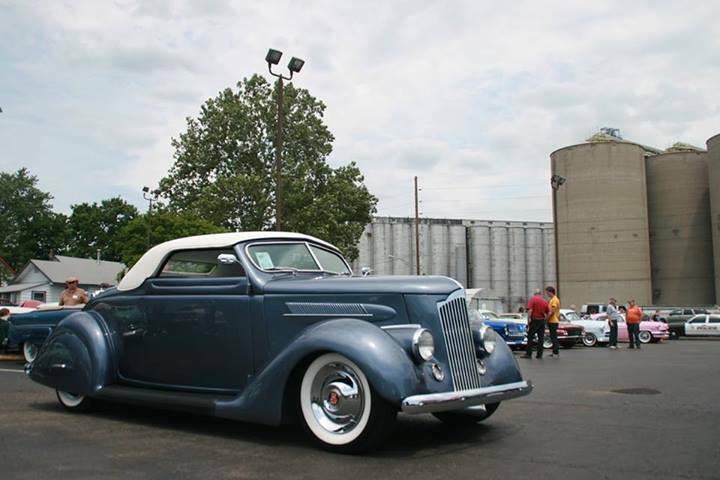 Jim says, "I took the car to my buddy's upholstery shop (Kiski Valley Upholstery in Vandergrift, Pennsylvania) and he did his best to meet my deadline to take the car to the Midwest Custom Car Revival in Indianapolis. 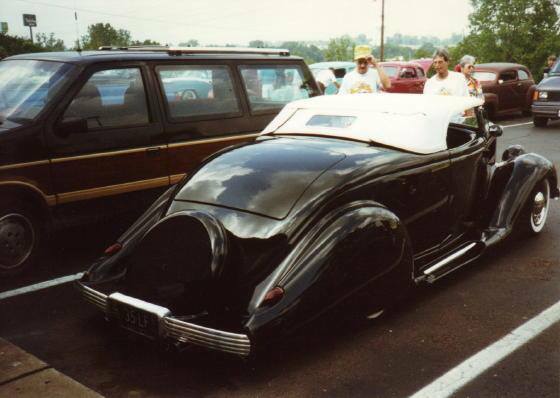 With only 300 miles on a fresh homebuilt car, my wife and I left on a 700-mile round-trip to Indy and returned with the Most Outstanding Custom Award." We have a feeling you better get used to hauling those trophies home, Jim! 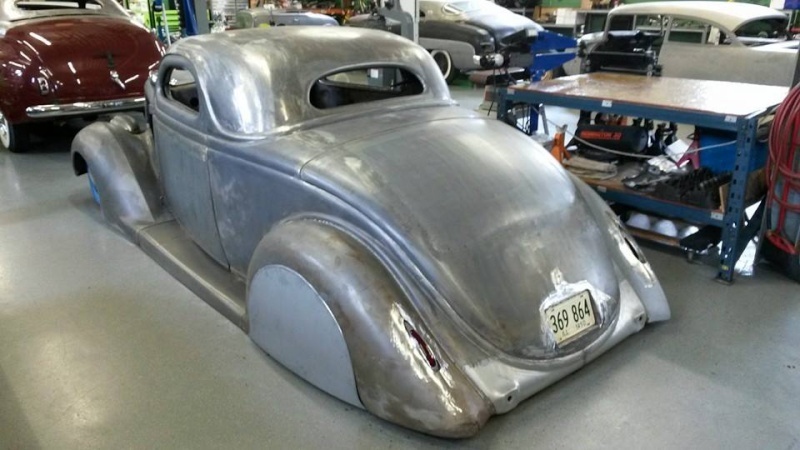 The entire stock chassis was replaced with a new version from Fatman Fabrications, offering a stiffer foundation for the roofless sheetmetal. 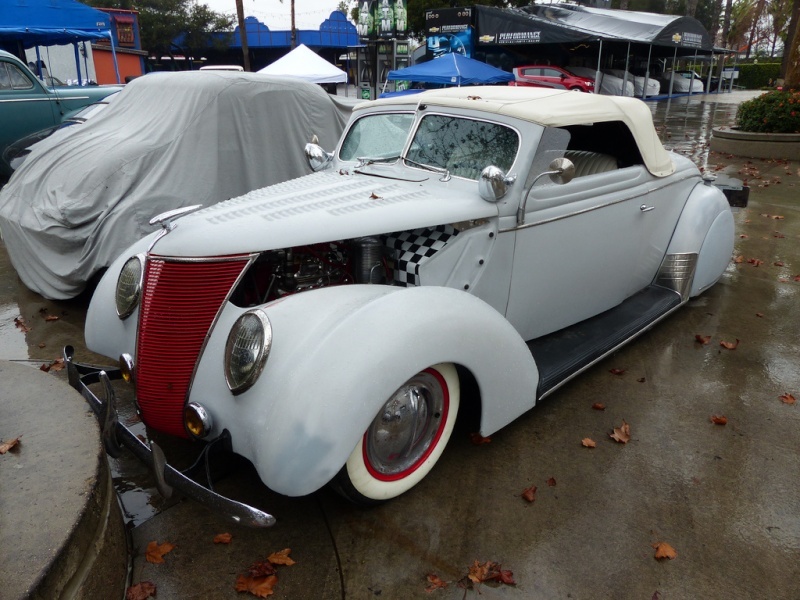 It features a Mustang II IFS with Ford spindles, QA1 coilover shocks, and a power steering rack. 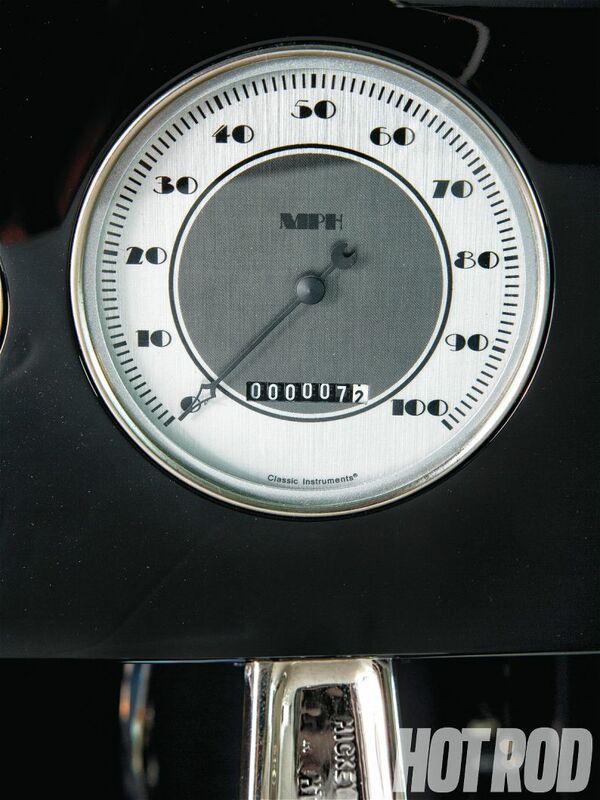 An ECI master cylinder and disc brakes bring everything to a stop. 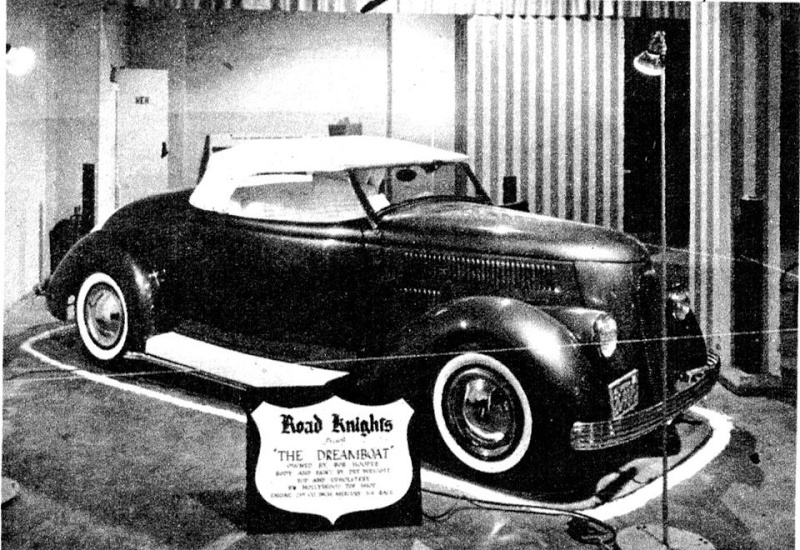 A Tanks 17-gallon steel gas tank lives in the stock location, fed through a filler door in the left rear fender. 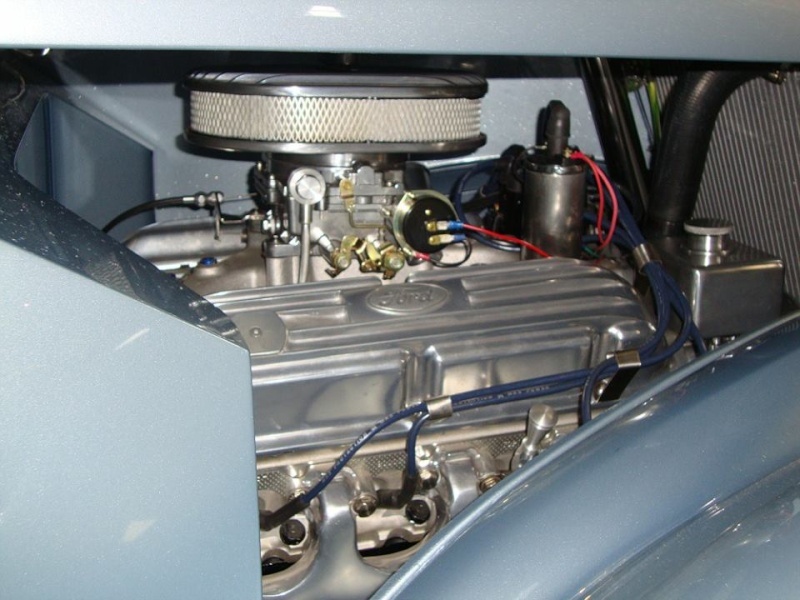 Between those rows of Chevrolet hood louvers you'll find another GM product: a 0.040-over 350 small-block from Blueprint Engines, outfitted with an Edelbrock 600-cfm carburetor on a same-make intake, and Alan Grove accessory brackets. 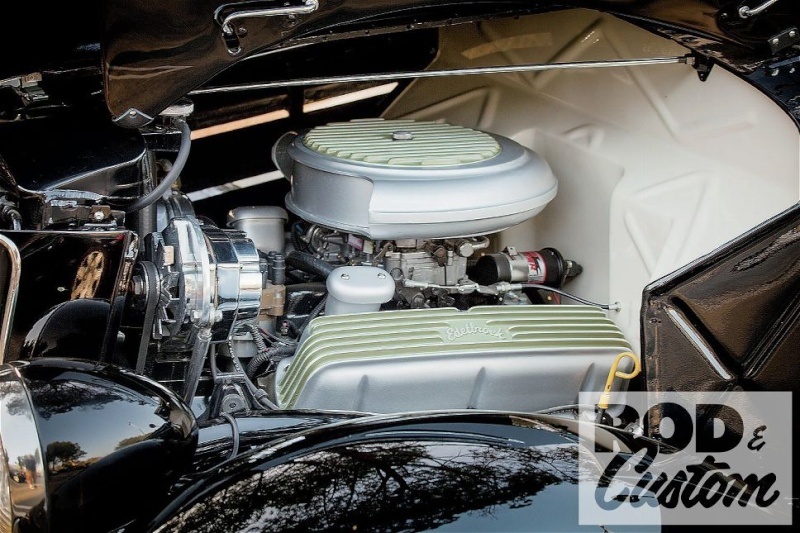 A PerTronix distributor and Taylor wires keep the fire lit, ram's horn manifolds take away the exhaust gases, and a Walker radiator keeps everything cool. Jeff's Transmissions in Gibsonia, PA, rebuilt a TH350, pushing the ponies down a Pittsburgh Driveline Service driveshaft to a 2.79:1-geared Ford 8-inch rearend. 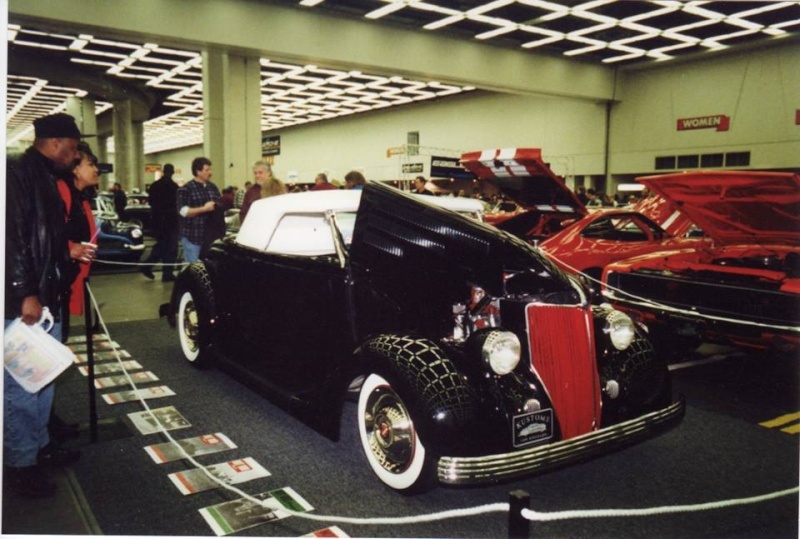 Behind those Sombrero caps and fender skirts are nothing more glamorous than a set of 15x5.5 Ford Ranger steel wheels, wearing a quartet of 205/75R15 Diamondback whitewall radials. A package this good looking takes a lot of planning and parts from several marques. 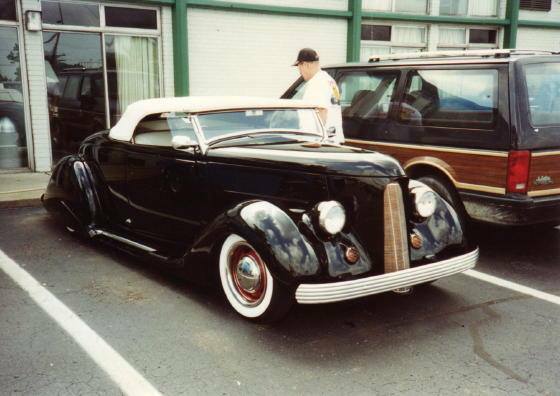 Jim had the 1940 Packard grille hanging on his garage wall for years, and already had the 1949 Ford parts car that donated the dash and windshield surround, but had to source the 1940 Chevy headlights, 1937 Chevy hood side louvers, and 1952 Buick parking lights. 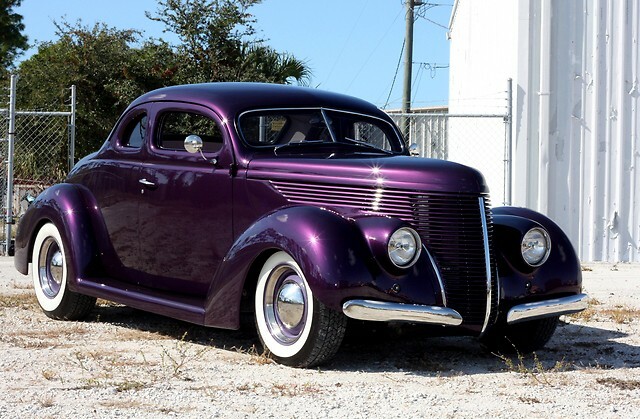 He then grafted them all together to appear as if they came from the factory that way, as well as molding the rear fenders, adding the teardrop skirts and 1940 Ford pickup bumpers, and fabricating his own Carson-style roof. To top it all off, he sprayed the car himself too. 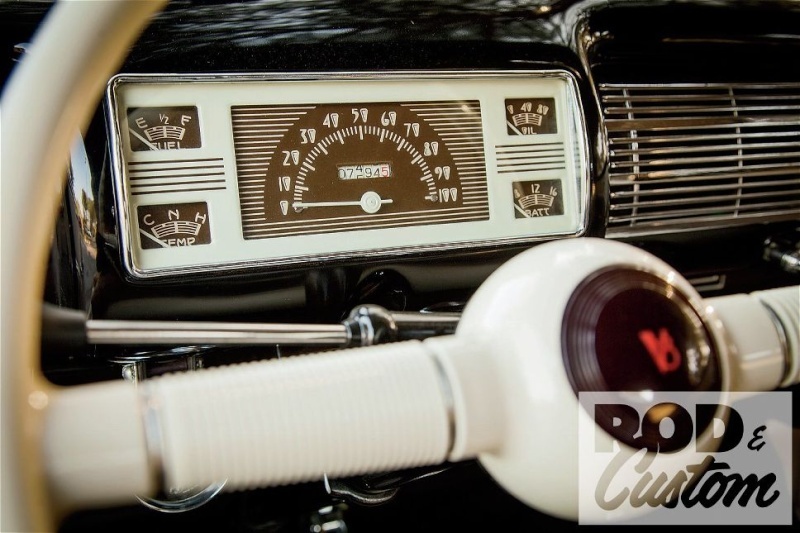 We've already mentioned the 14-inch narrowed 1949 Ford dash, which use its stock gauges and radio. 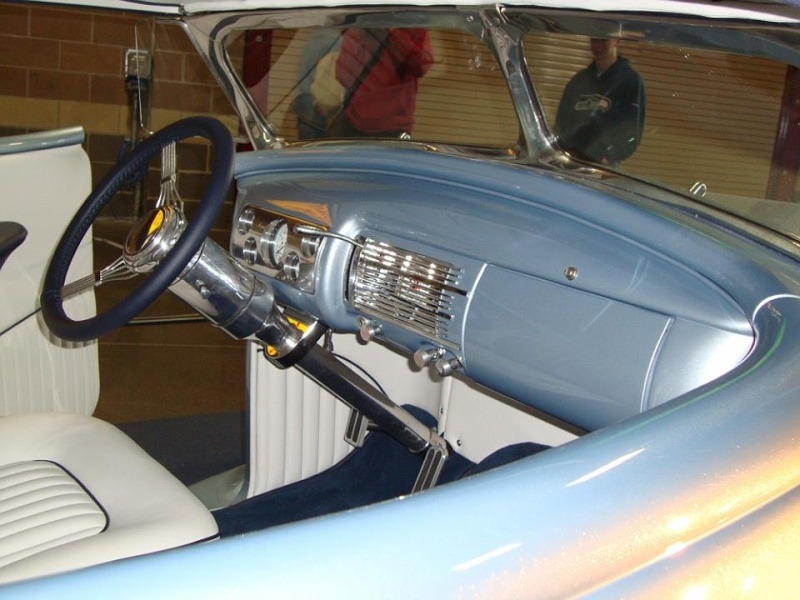 Bolted to its underside is a GM tilt column, while a Lokar shifter and e-brake pass through the marine-grade navy blue carpet. 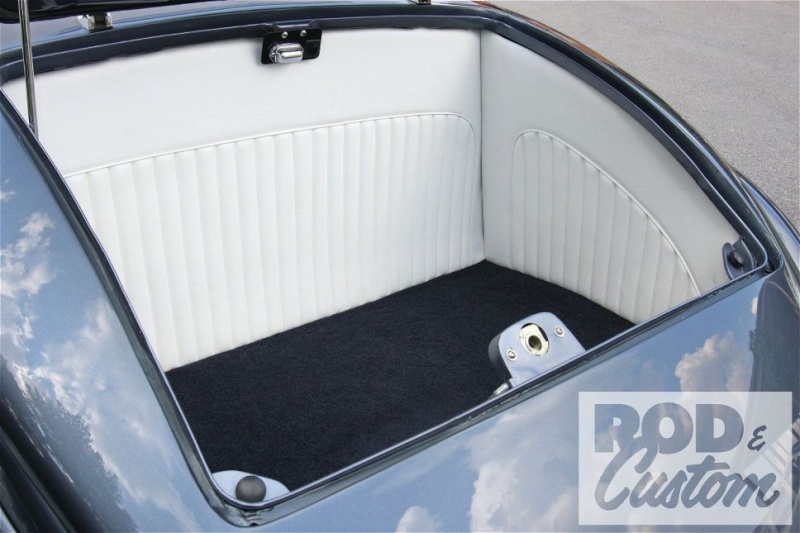 The original bench seat is now upholstered in white Ultraleather, as are the door cards and kick panels. A Vintage Air heat and defrost unit lives behind the dash, while a hidden Pioneer stereo and Kenwood speakers provide music. Jim handled the wiring himself, using an EZ Wiring harness. 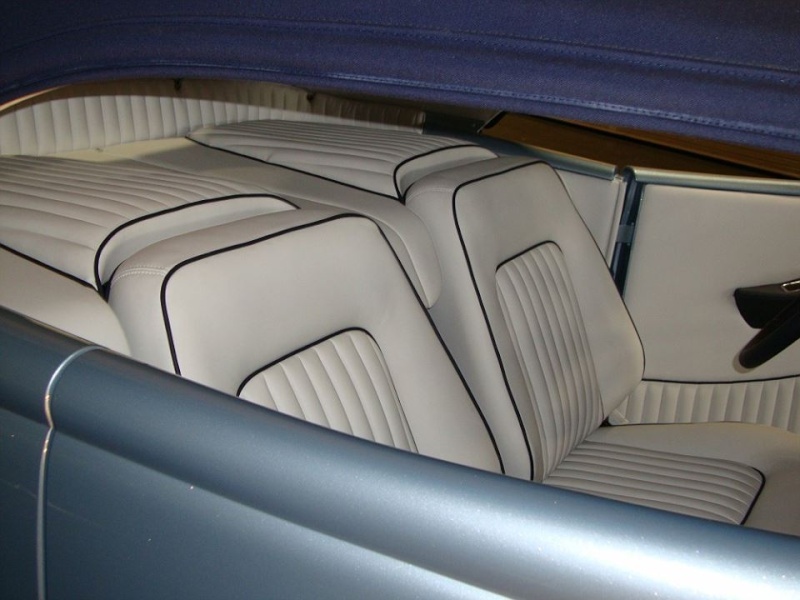 The upholstery extends to the trunk too, where a false front "wall" hides the spare tire and tools. 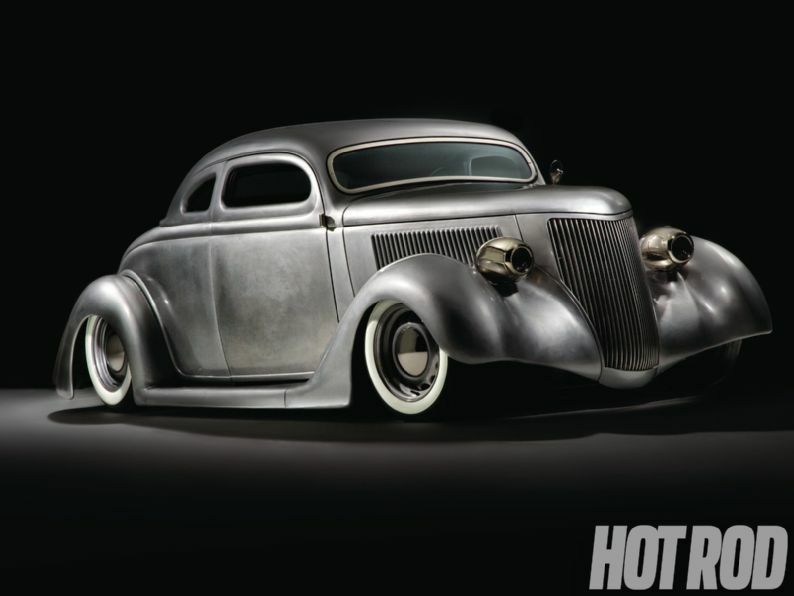 You may recognize the name John Mearns as owner of the stunning '36 three-window that was featured, not once, but twice, on these very pages, in bare metal and as a finished kustom. 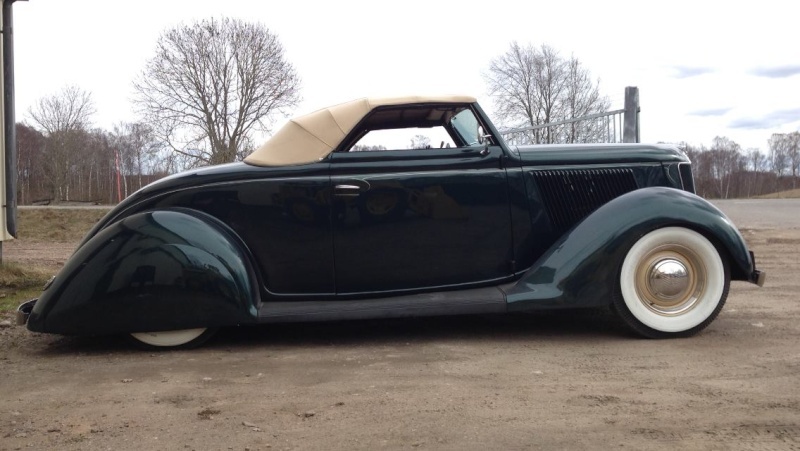 The cabriolet you see here has had his name on the title even longer, and this is its second go-around in his possession. 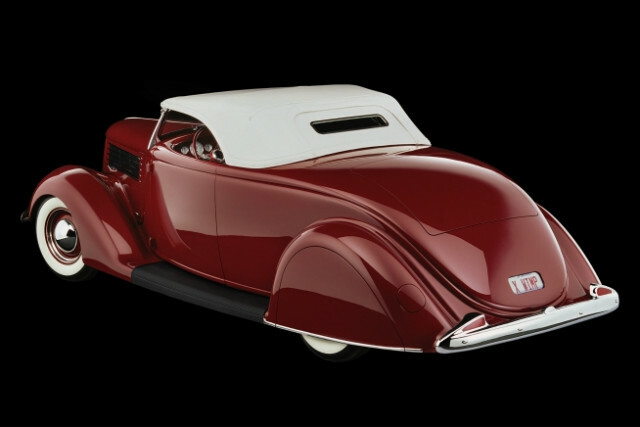 As John puts it, "I got the bug to build a cabriolet after owning my first '32 roadster, and figuring out I wanted to have windows that rolled up. 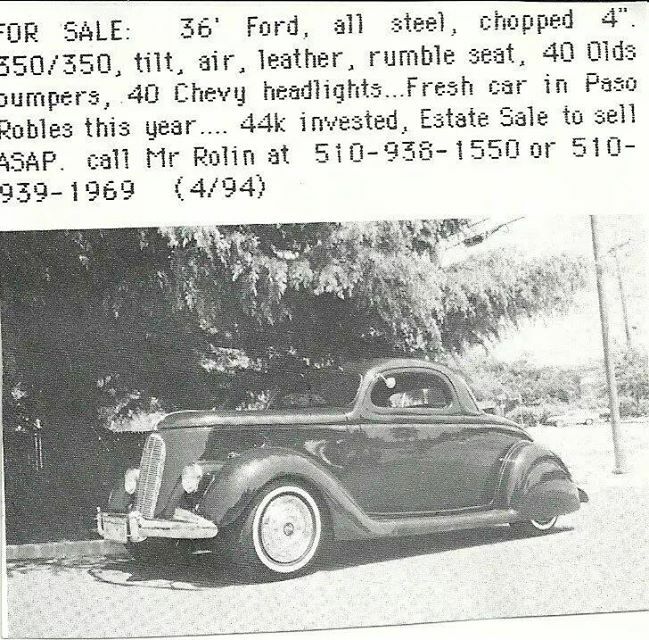 I found this car 15 years ago, listed in The Recycler as an old Ford convertible project. It was 50 miles from home, and an abandoned project. The guy had butchered the frame so badly while trying to build a lowrider out of it that we just threw it away. The body seemed OK but we soon discovered it was full of rust, had probably been hit at some time, and needed a lot of repair. 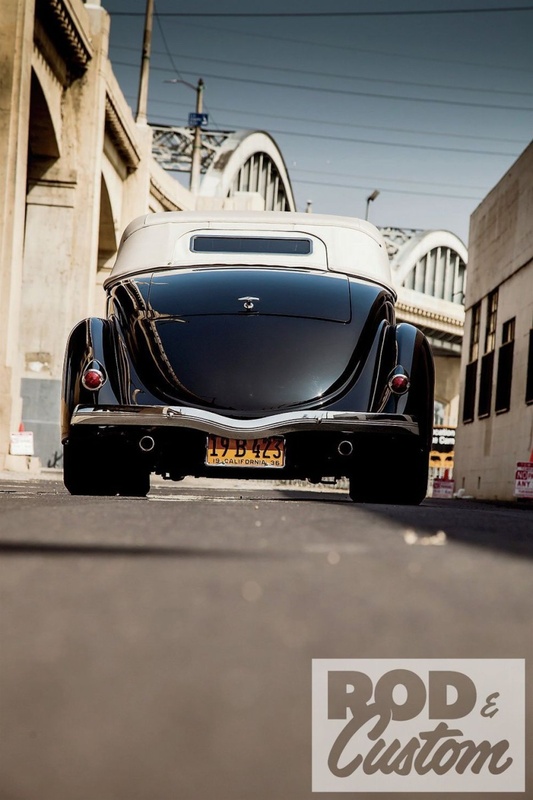 "There are two distinct phases to this car's history since I've owned it. 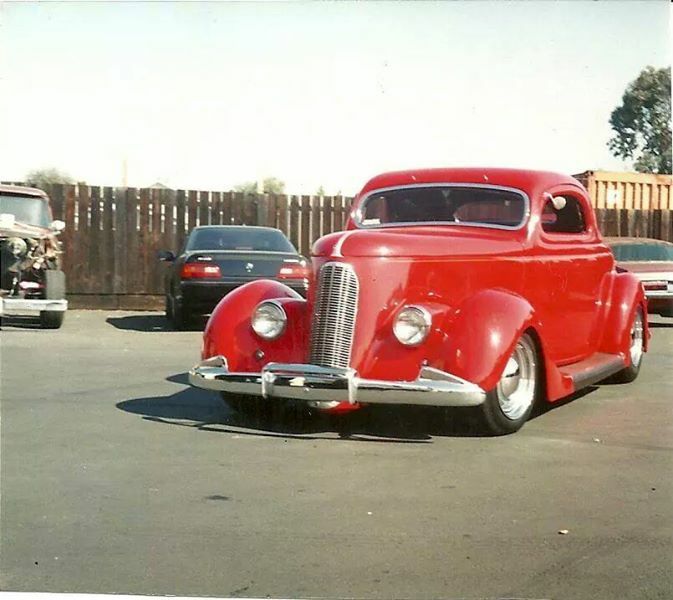 The original build was done for me in 2000-01 by my friend Bruce Stedman at Street Machines by Stedman, in Hemet, California. 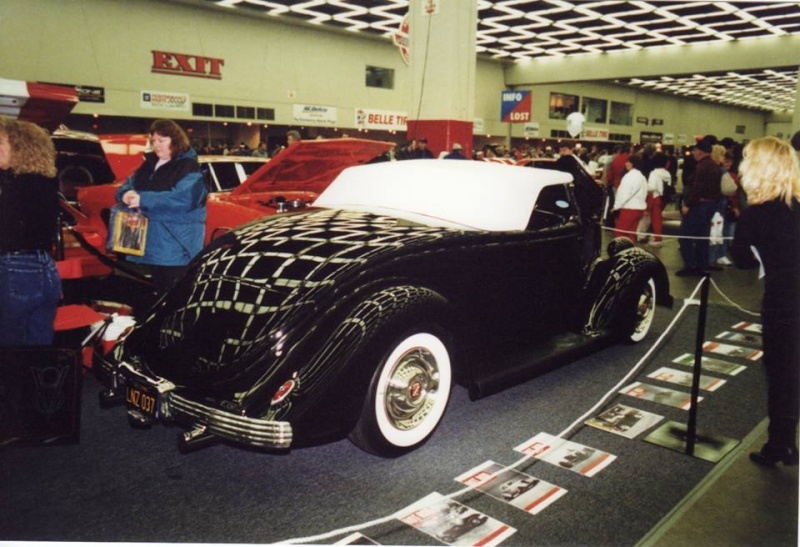 I then drove it over 30,000 miles during the next 10 years in black primer with Mexican blankets over the seat foam. That was not the plan but when we first got it on the road we thought we'd drive it for a while to get the bugs worked out, which we did, but it was so fun to drive and so reliable that I just didn't want to take it apart to ‘finish' it. 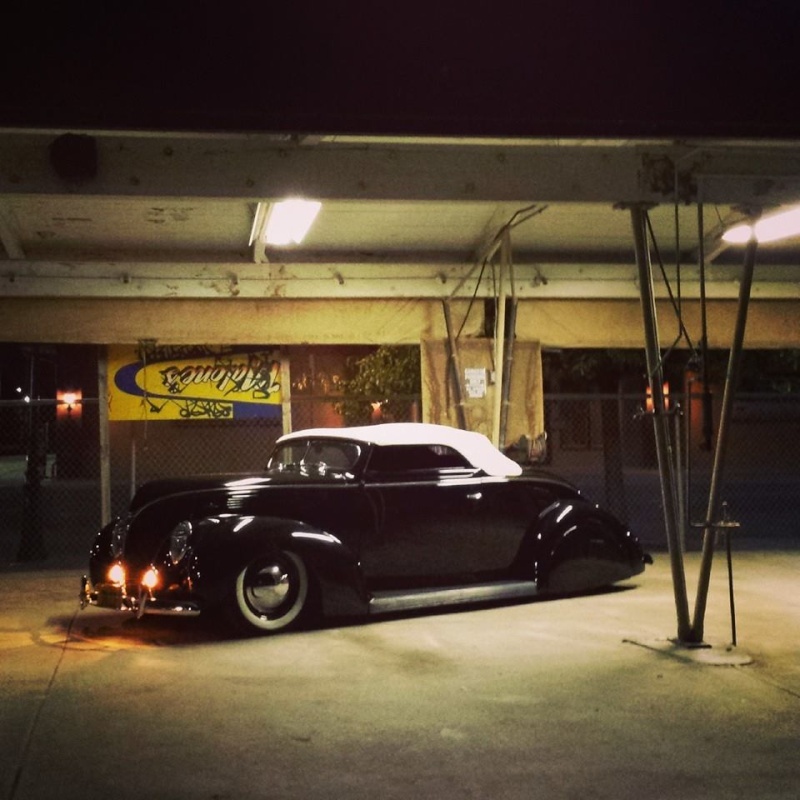 "Then a couple of years ago I was approached by Dave Martinez at Viva Las Vegas as I was parking my '36 three-window next to a stunning black '36 roadster with a padded Carson top. 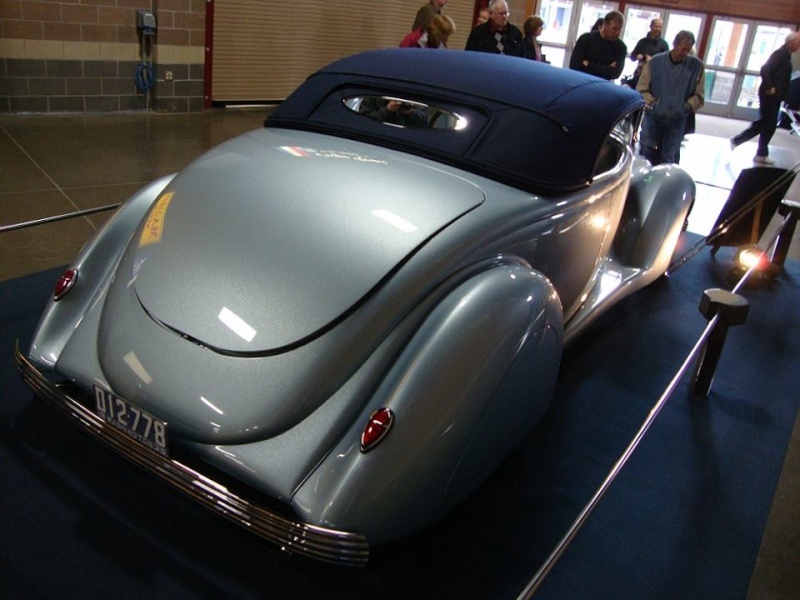 Martinez told me he had just done that top and the paint and interior on the roadster. Later that weekend he asked if I still had my cabriolet. 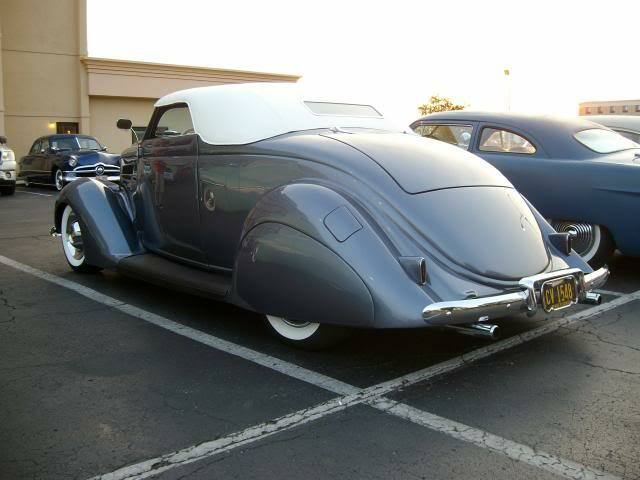 I wasn't sure how he knew about this car, as it really seemed to me like no one ever noticed it. Once he found out that I still owned it he suggested that he could do a Carson top for it. He wanted to do another one while the first one was fresh in his mind. "Over the next few months we hatched a plan. I decided to do the Carson top and to redo the interior at the same time, as I'd never been happy with the cheap interior and top I'd had done a few years earlier. 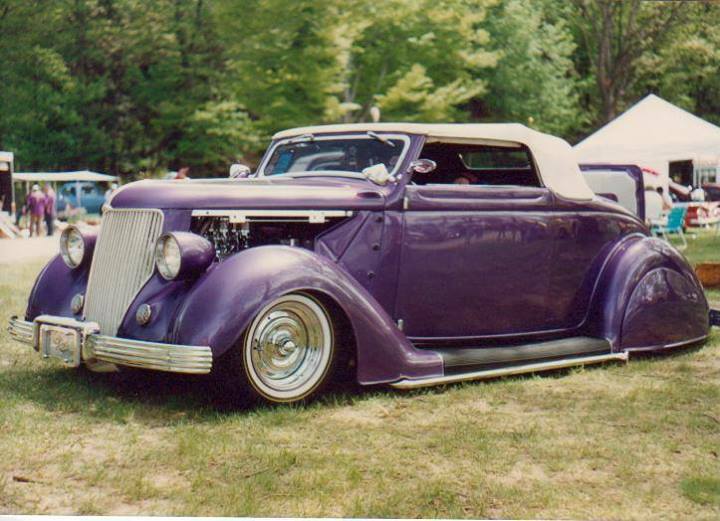 Martinez did the top and the upholstery and it really made the car look better. Well, only if you ignored the paintjob. 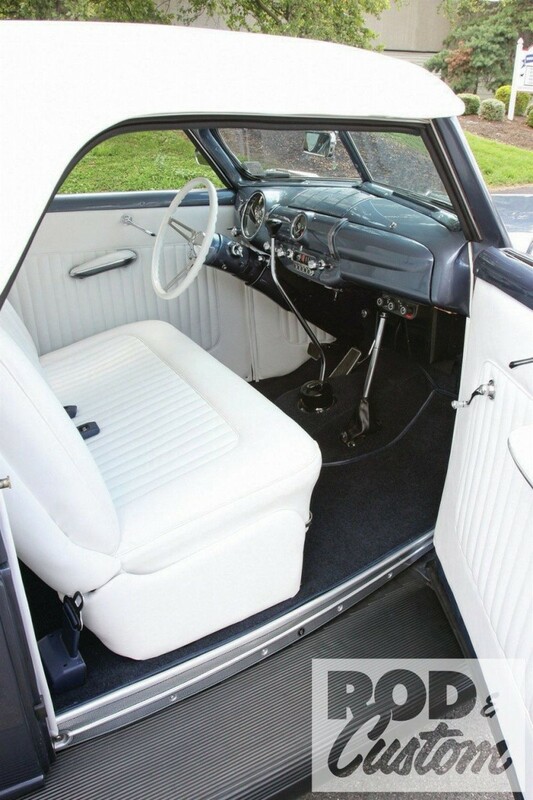 You see, the white top and beautiful interior really made the paint look terrible by comparison. It was like an old suit with a brand-new pair of shoes. When the shoes and the suit were of the same ‘vintage' it all worked together and neither made the other look bad, but this was a real problem. 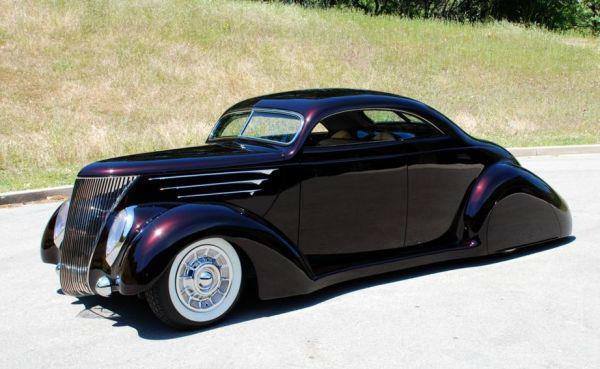 Martinez didn't think so because he knows how to do paint and body and simply said ‘No problem, John, let's paint it.' 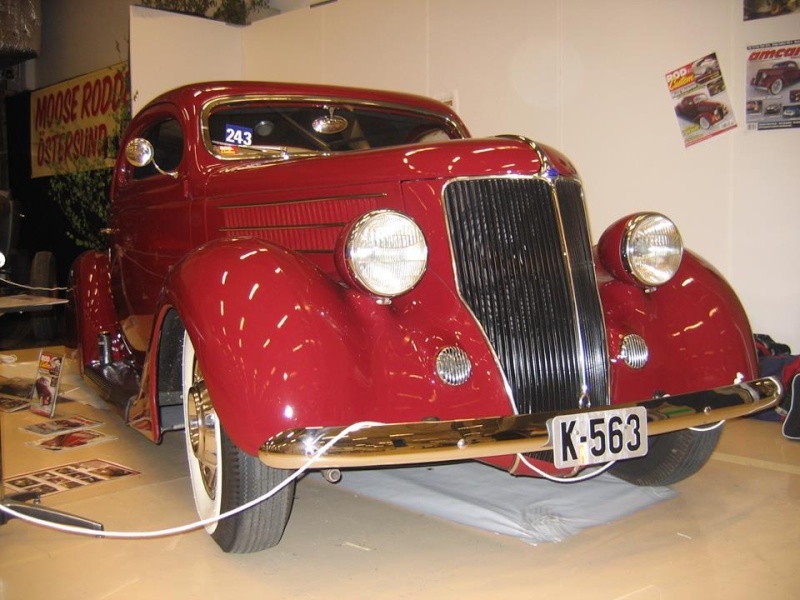 The real problem was that I could not afford to paint it at the time, so I lived with it for a while until I was able to sell a load of parts that I had collected for another ‘someday' car. I figured it best to go all the way and finally really ‘finish' this one. 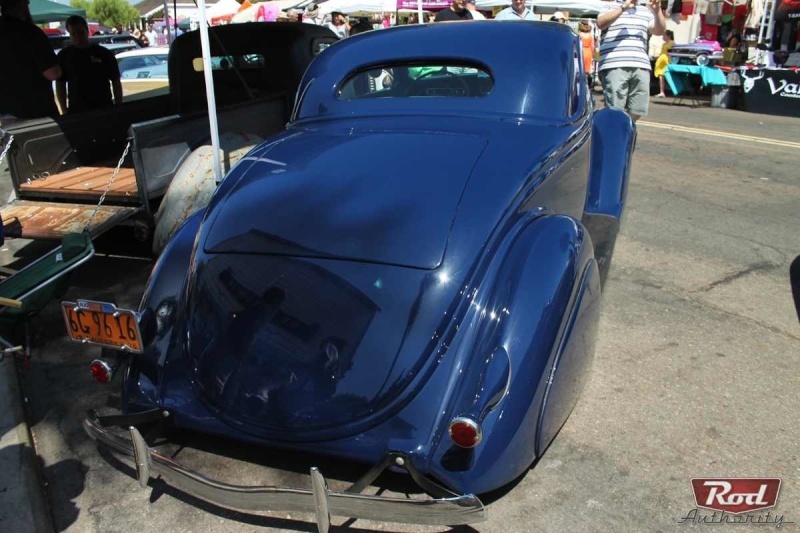 "Dave fixed all of the little stuff that was not right in the bodywork: the door gaps were a little off and the doors sagged, the decklid never fit right, the rear pan was installed ever so slightly down on one side. You know the story; a bunch of little stuff that no one else would notice, but I did. It should be noted that these old issues were not from Bruce Stedman but from a body guy I hired on the first build. Martinez really made all of this stuff right, in fact better than right, it was excellent! 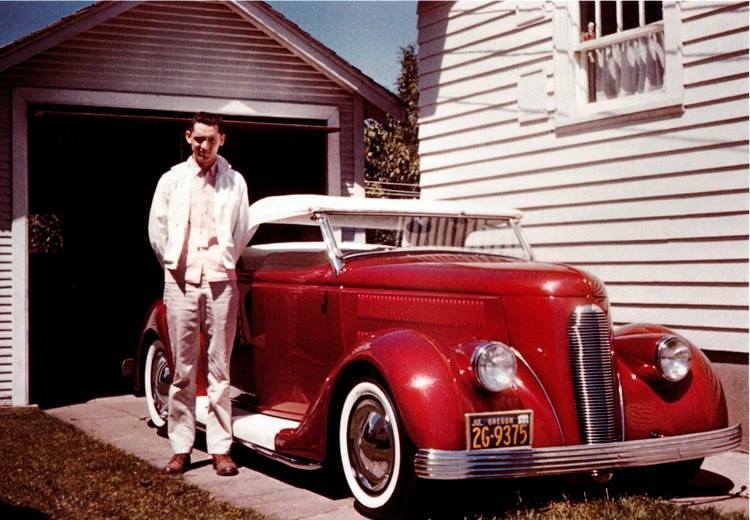 Then he painted, cut and buffed the car, and I took it home with the instructions to give it about two weeks before applying wax. The car looked so nice I was a little nervous about caring for it. "This is where the story gets interesting. You see, the paint was a little soft when I took it home. Martinez had used a very good-quality product and had followed all of the manufacturer recommended procedures to a T. After two weeks it was still soft. Not soft enough to leave a fingerprint, just enough that you could press your fingernail into the paint and leave an indentation. Martinez was getting worried and so was I. We had the paint manufacturer's rep come out and Martinez retraced his steps and painted some panels (with the same products leftover from the job) and they wouldn't harden either. Tests were done by the paint company and it was determined that we had received a bad batch of hardener and the paint would probably never harden. I am not saying who they were on purpose because they offered to provide new product at no cost (which says a lot about them) but I knew if we re-did it I was not taking a chance on that paint again. "Right about this time Martinez relocated to Palm Desert where the temperatures are over 100 degrees in the summer. 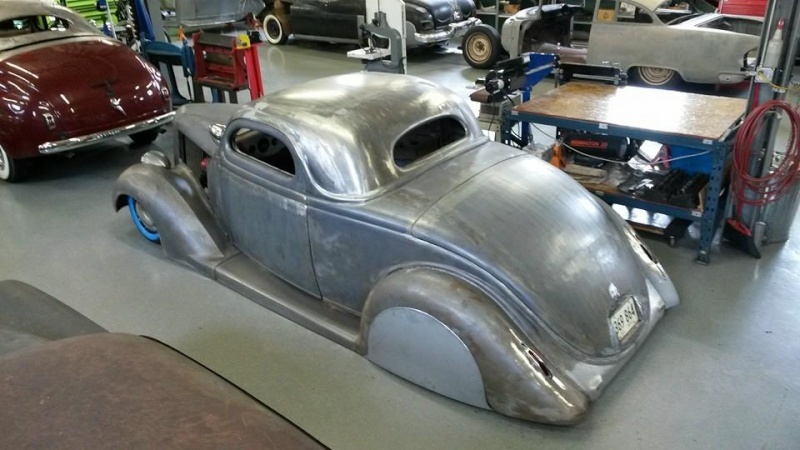 We thought we might be able to "bake" the paint hard so we brought the car to his shop, Martinez Industries, and he rolled it into the scorching heat every day for a month. It did not work. I thought I was on my own and would have to deal with this by paying for another paintjob but Martinez is a man of great character and told me he would do whatever was needed to make it right. 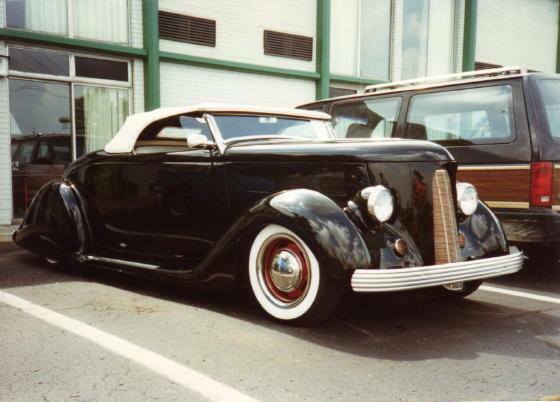 The phone rang one afternoon and it was Martinez telling me that if I would get the new material, he wanted to completely re-paint the car. 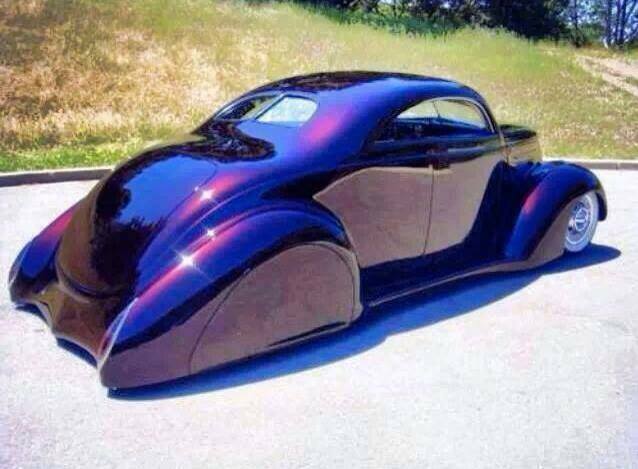 He would sand the old paint off and start fresh. I really could not believe it and actually felt bad for him. Here was a problem that was not really his fault but he didn't want his name on it if it was not right. So over the next six weeks Dave completely redid the paint. The car is beyond nice (and the paint is very hard). 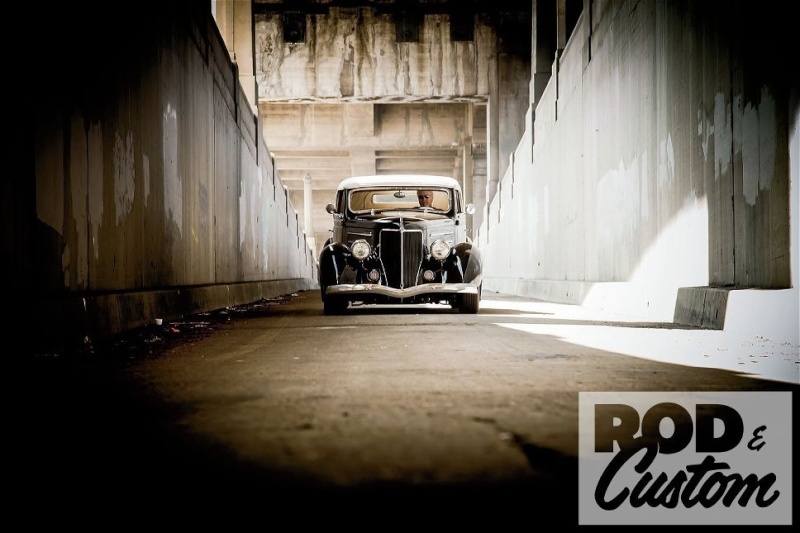 Dave Martinez is a man of character, something even rarer than a '36 Ford Cabriolet!" The original chassis was too hacked up to use, so a Total Cost Involved replacement now sits under the body, using the same company's Mustang II–based IFS, complete with antiroll bar, with a Flaming River power steering pump and rack. 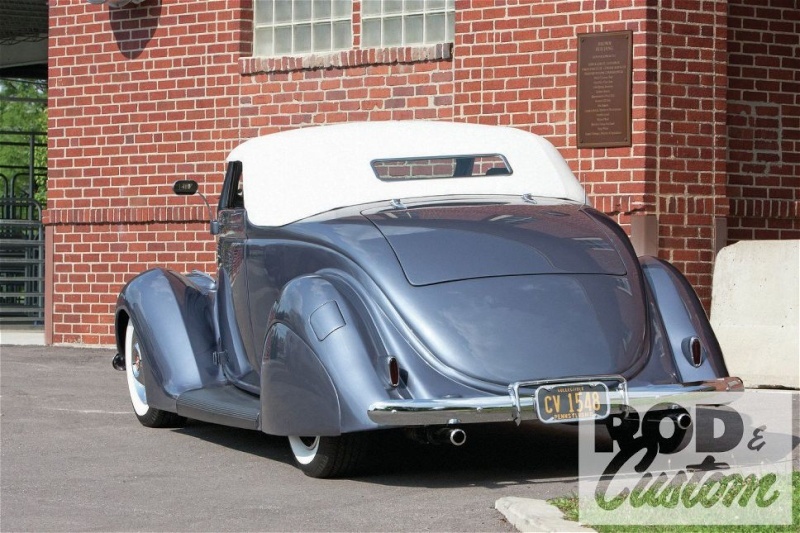 The stock gas tank was retained, with the filler moved to the trunk. 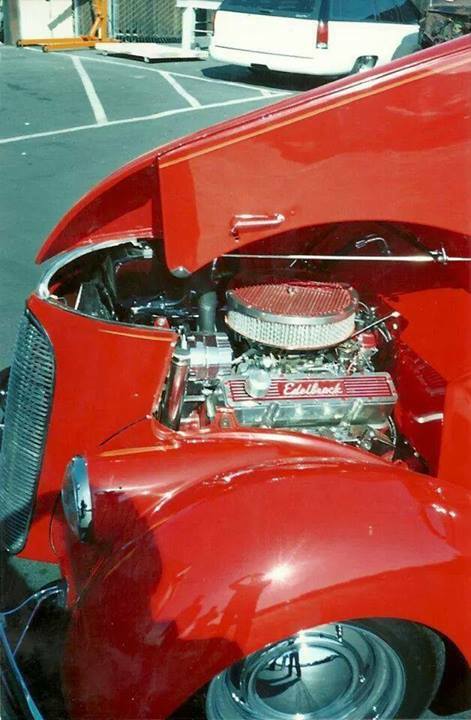 A Ford Racing Performance Parts crate 351 Windsor makes a change from the expected SBC or Flathead, complete with Edelbrock 600-cfm carburetor, Cadillac repro air cleaner, and Edelbrock finned cast valve covers. 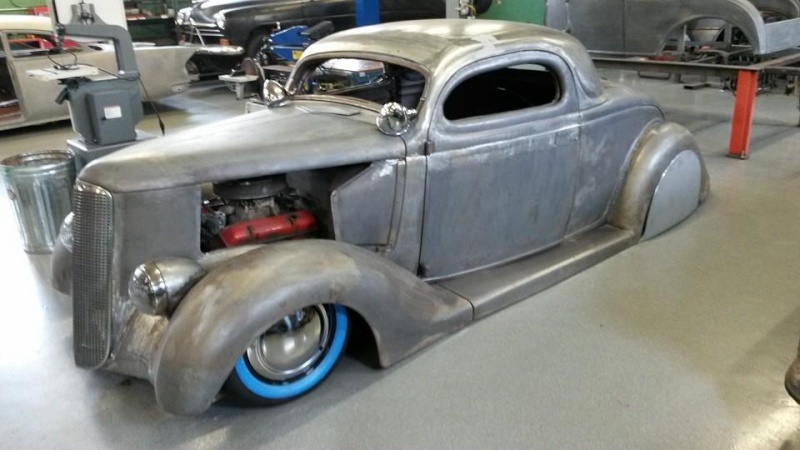 The Flowmaster exhaust features cutouts for "scaring old ladies and kids!" If you were expecting an auto trans think again, there's a Tremec five-speed behind the small-block Ford, with a modified old truck shifter. 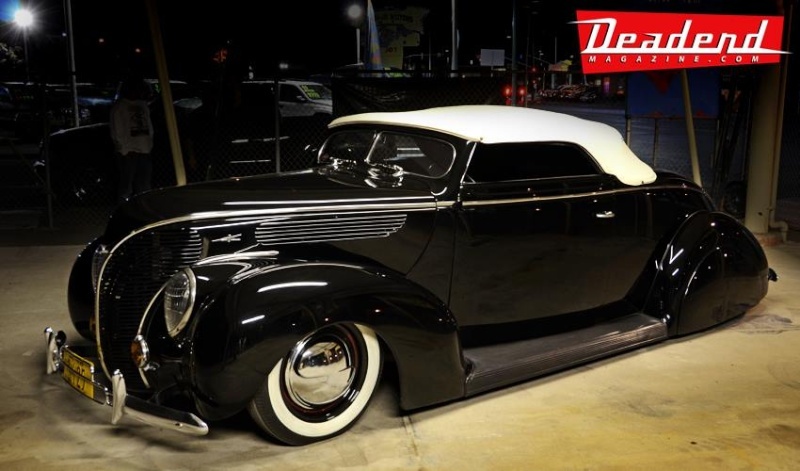 Wheelsmith Gennie wheels measure 5x15 at the front and 8x15 rear, with wide whitewall radials. 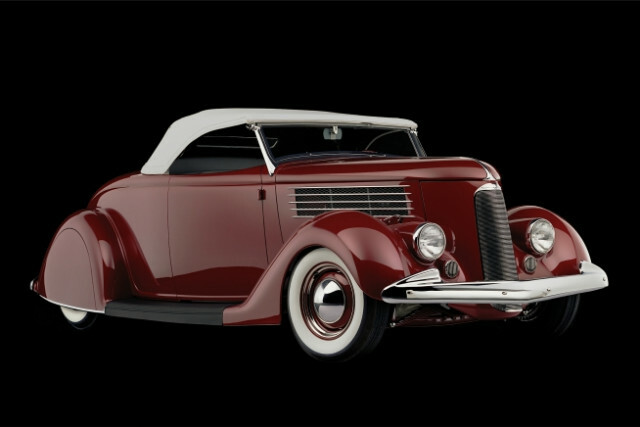 The original Ford cabriolet sheetmetal has seen some changes, notably the conversion of the rumble lid to a trunk, the addition of '36 Chevy hood louvers to the hood sides, and lowered headlights. 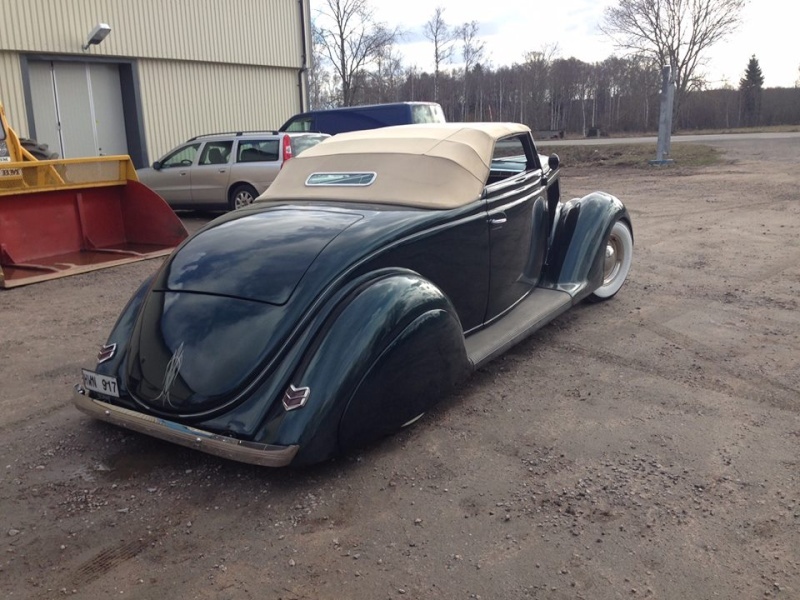 The window frames have been chopped and re-chromed, and the bumper brackets front and rear shortened. 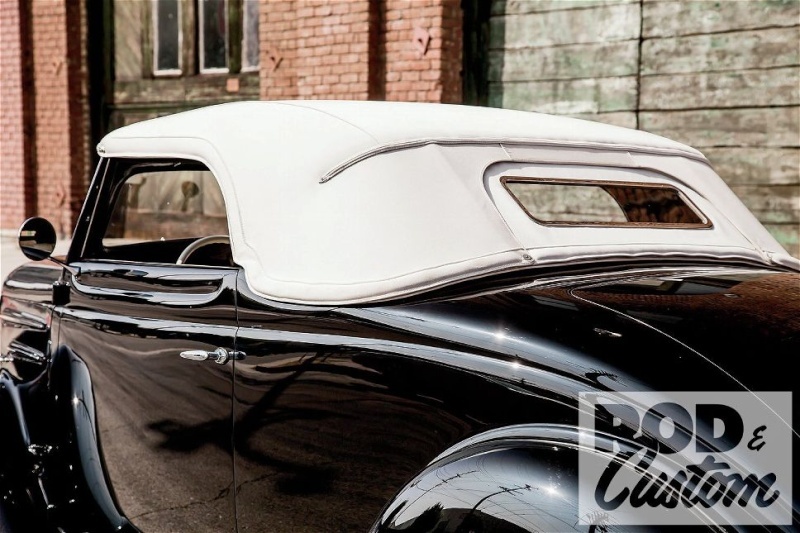 Dave Martinez (Martinez Industries), handled the 1 1/2-inch roof chop and made the padded Carson-style top with zip-down rear window. 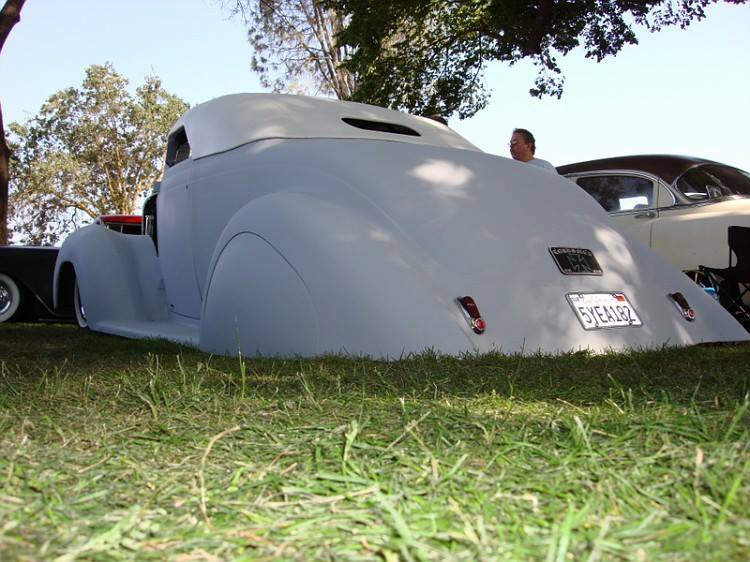 Martinez also tackled the bodywork and laid on the House of Kolor black paint. 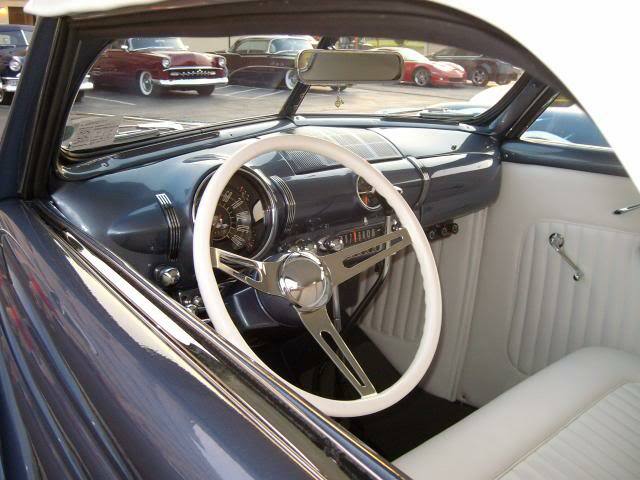 The '40 Ford dash is what you'll immediately notice, matched by a LimeWorks '40 Ford steering wheel. A Newport Engineering windshield wiper motor replaces the original. 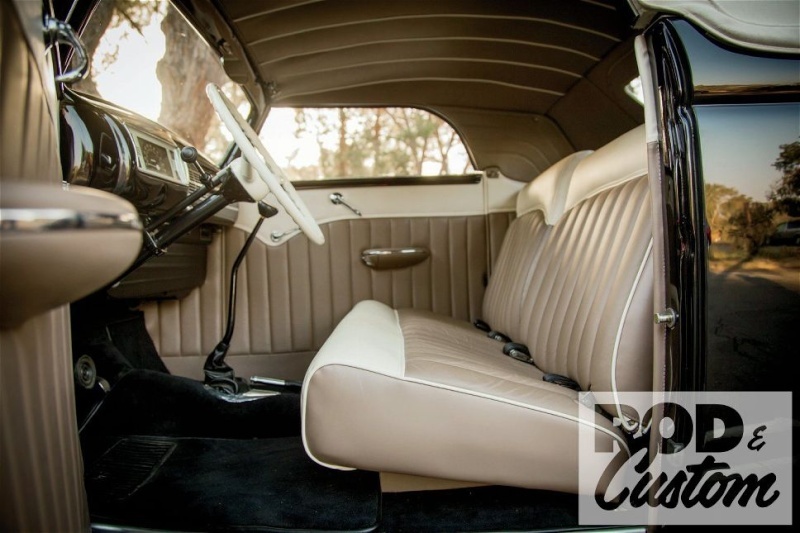 Dave Martinez modified a Wise Guys seat to fit, before trimming the interior in leather and vinyl and black German wool carpet. The wiring remains from the first build by Bruce Stedman.